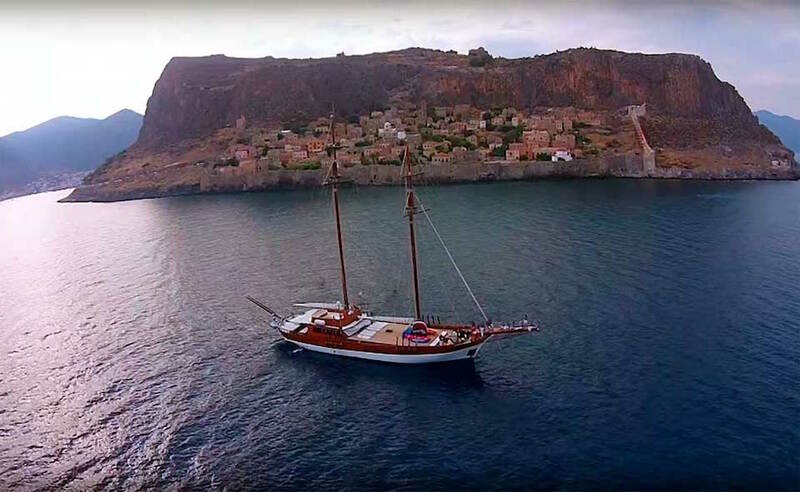 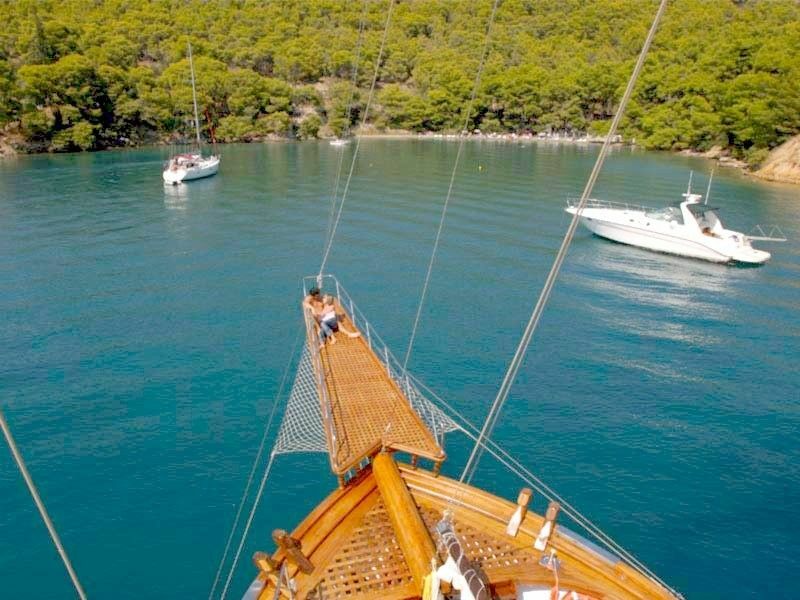 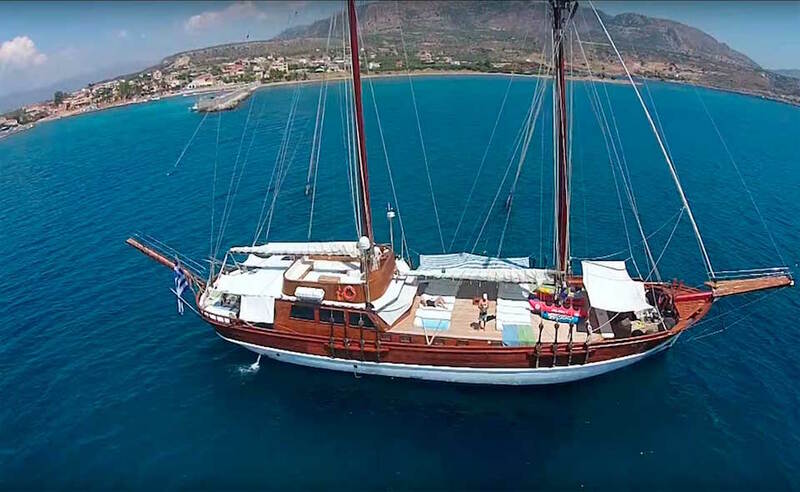 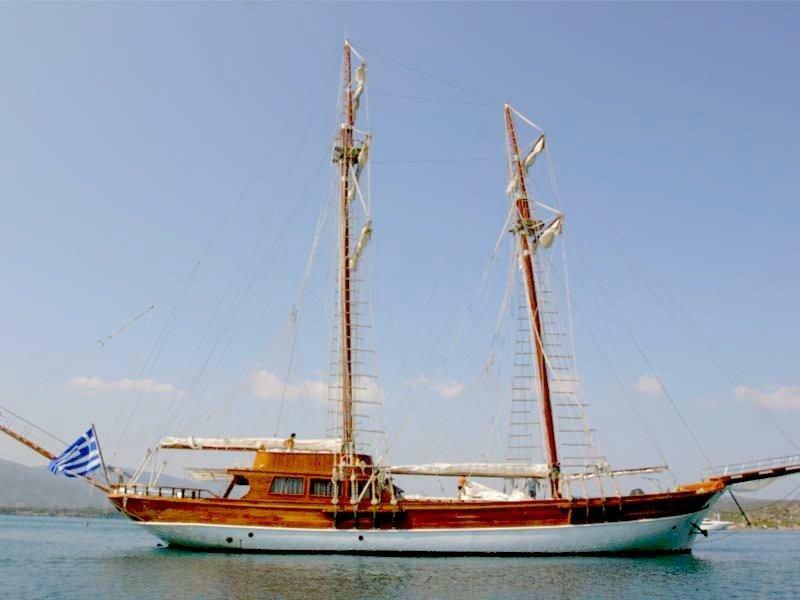 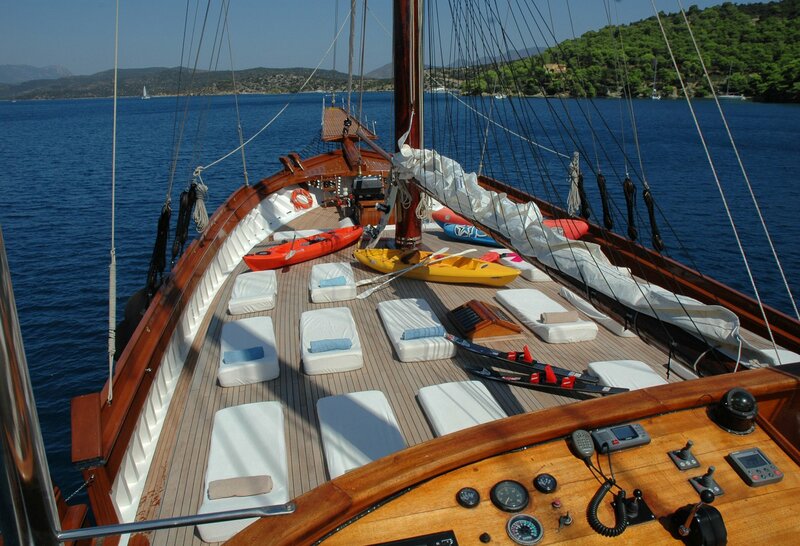 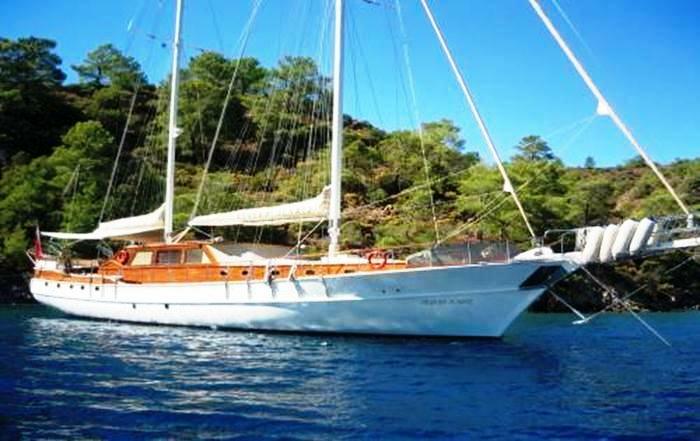 Sailing yacht MATINA is a 38.00m (124' 8") Gulet built in Turkey in 2000. 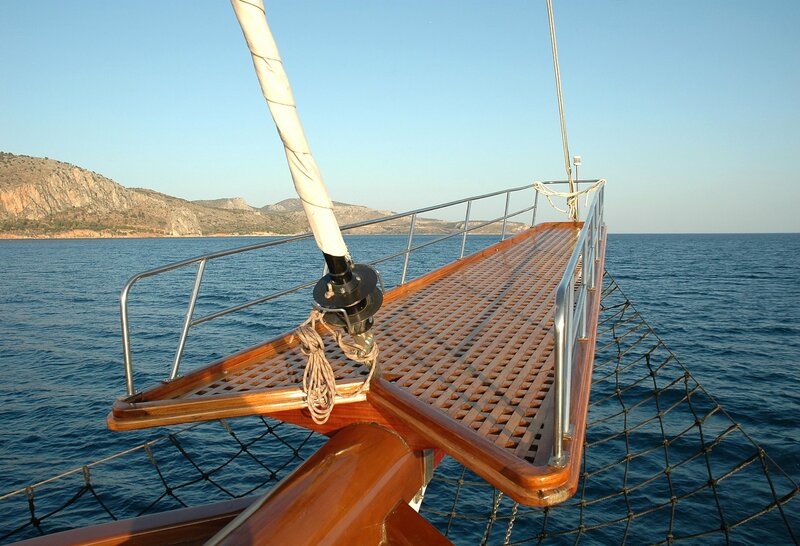 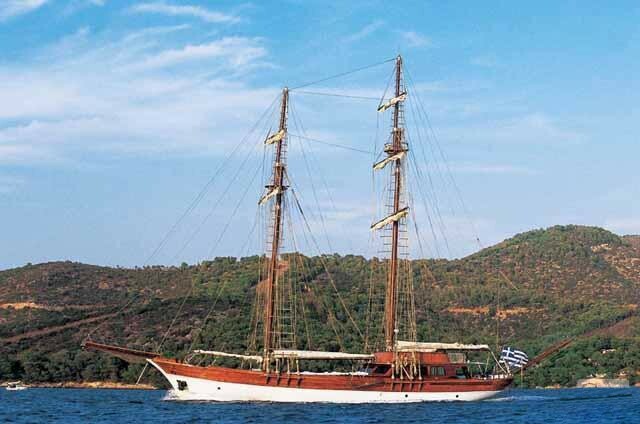 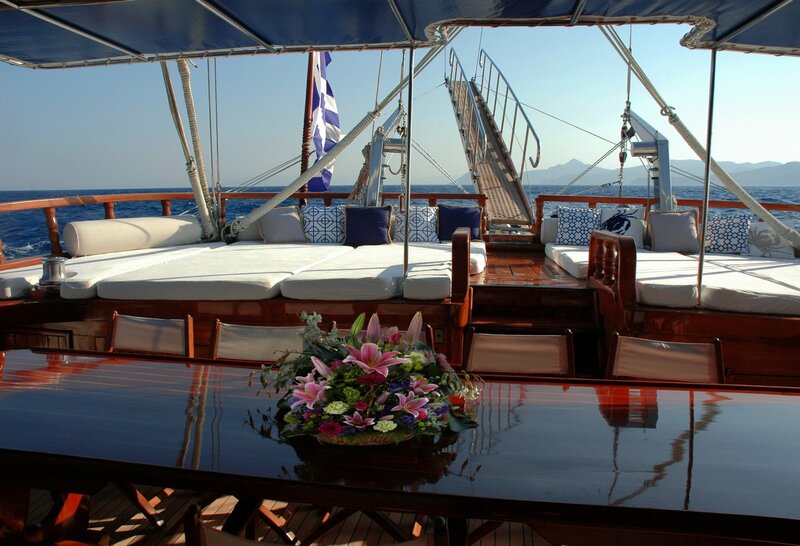 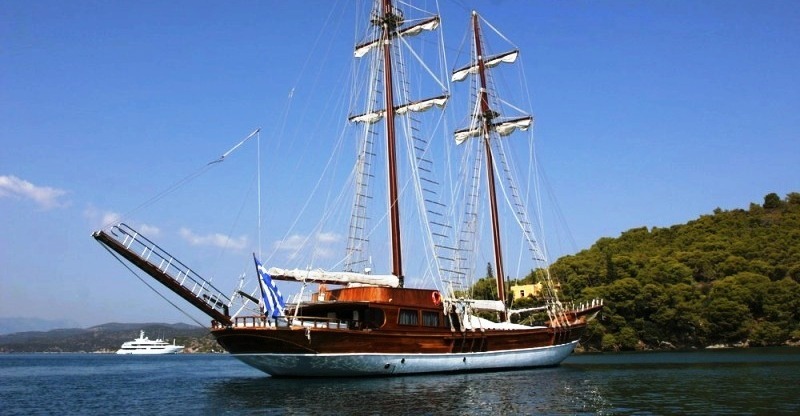 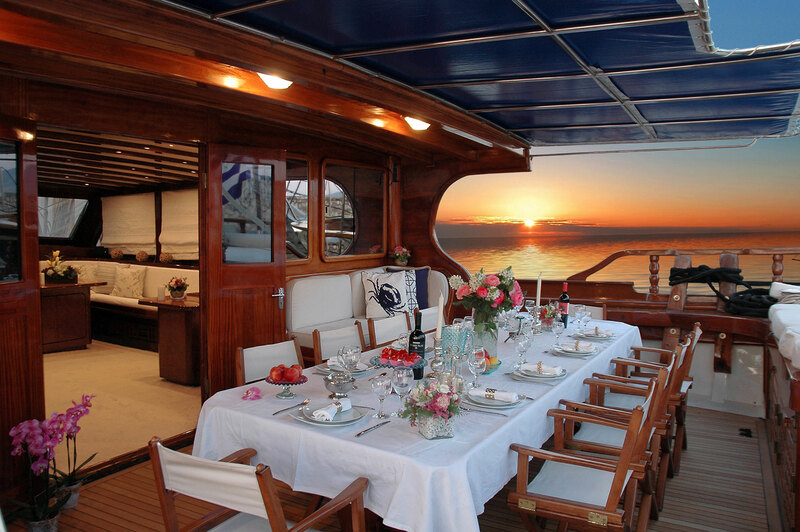 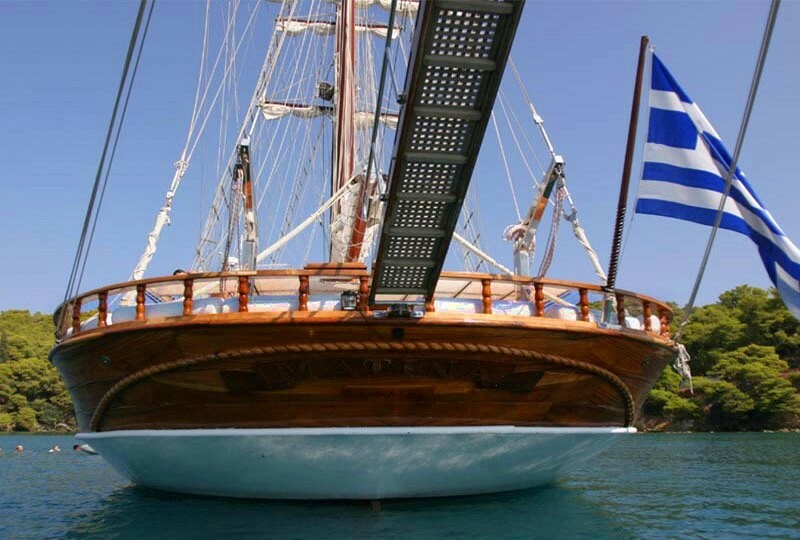 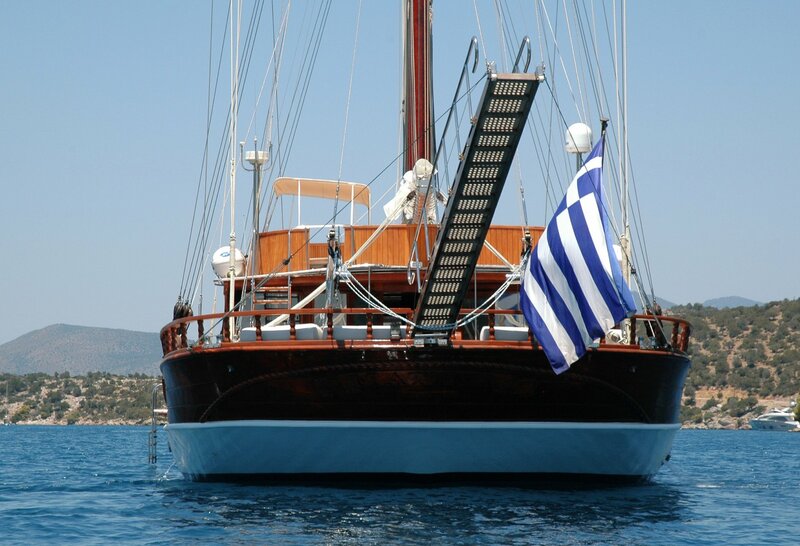 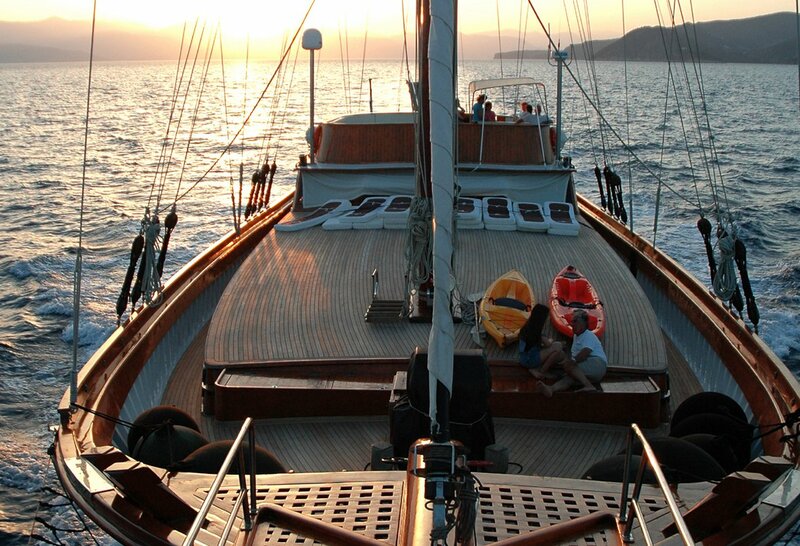 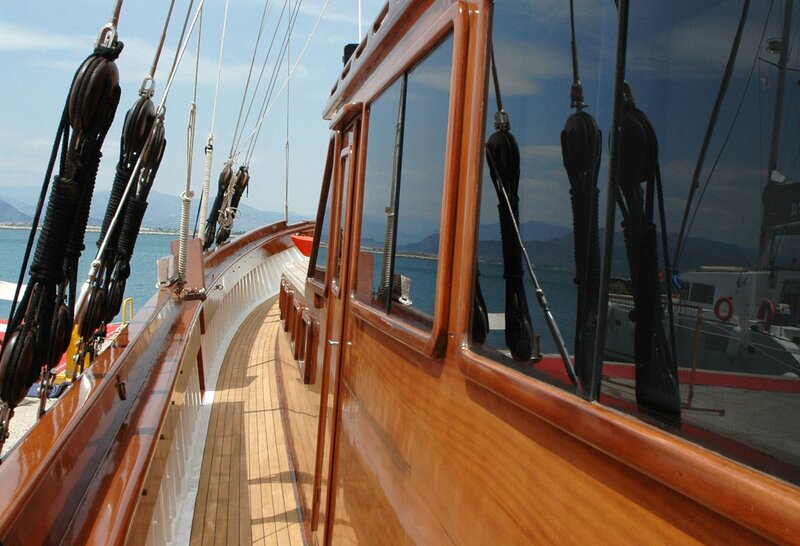 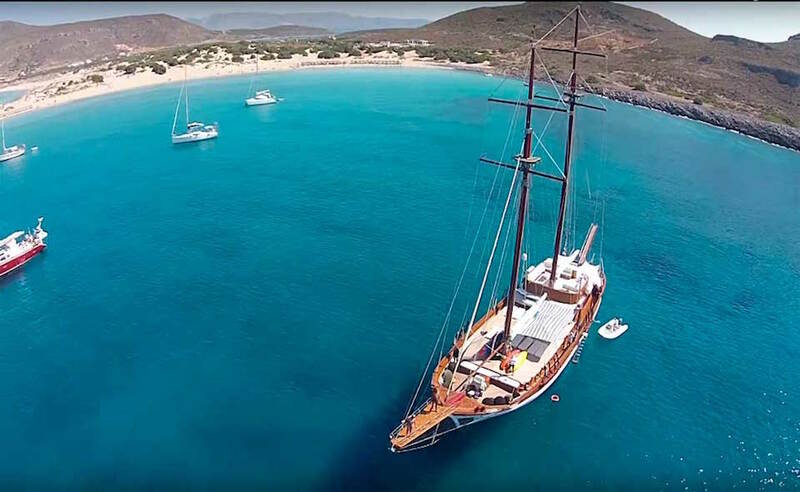 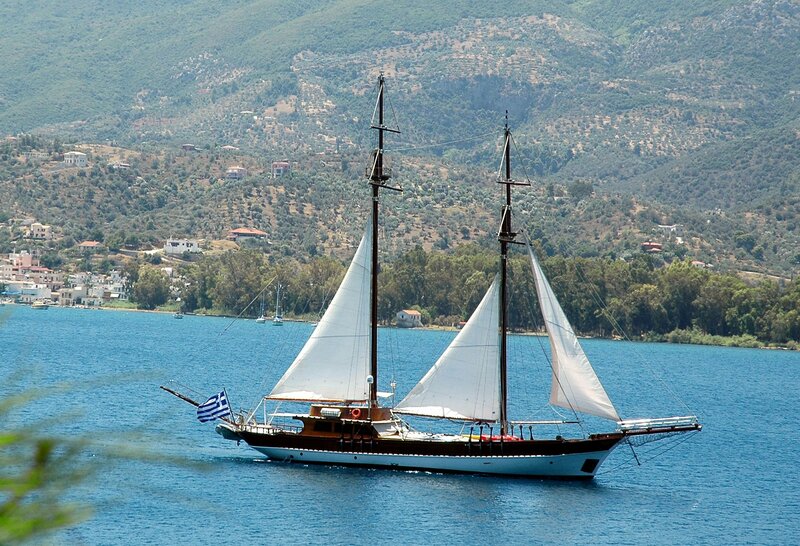 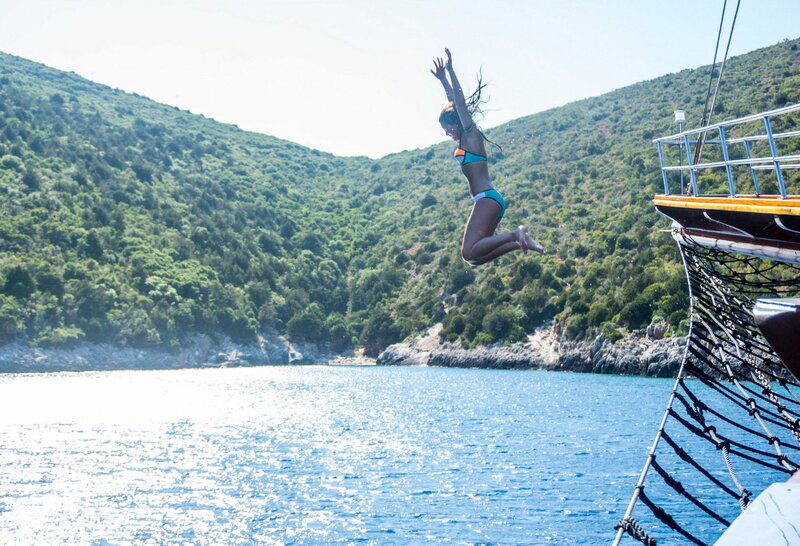 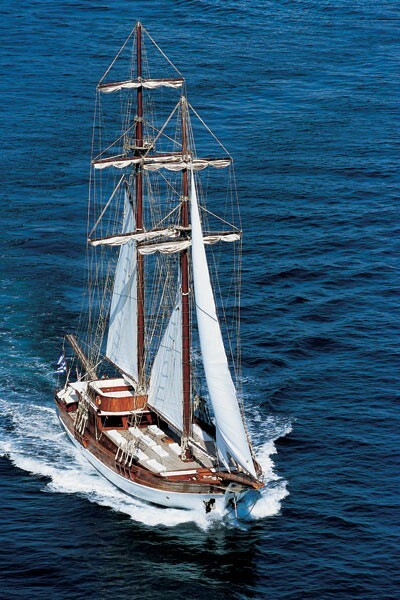 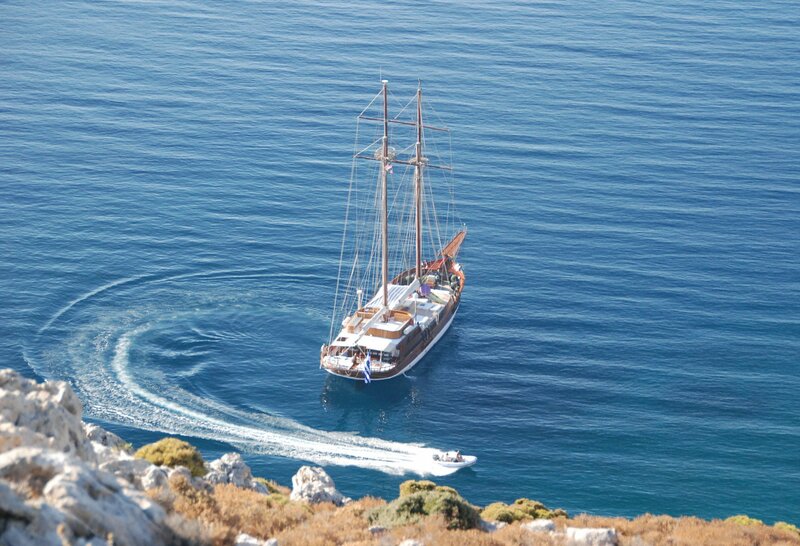 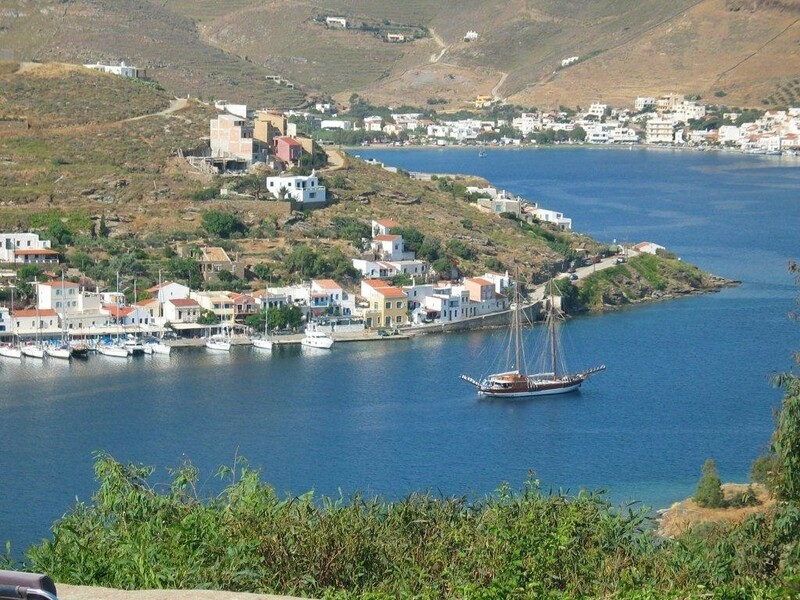 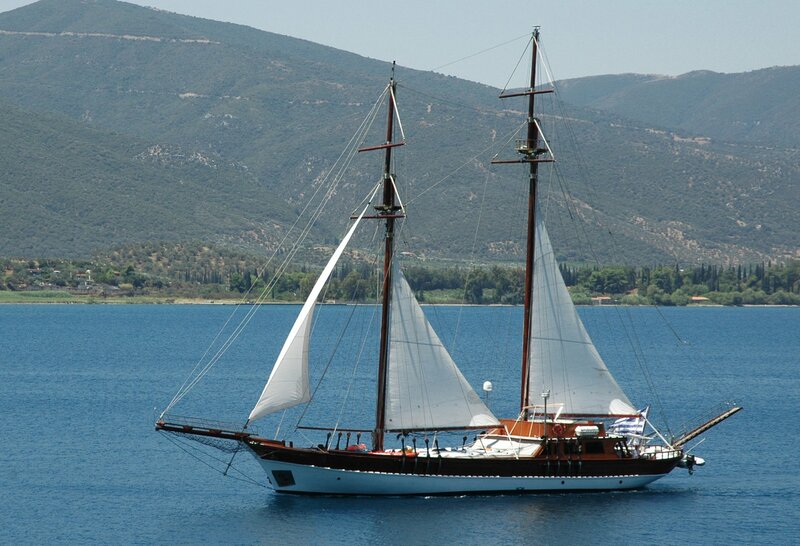 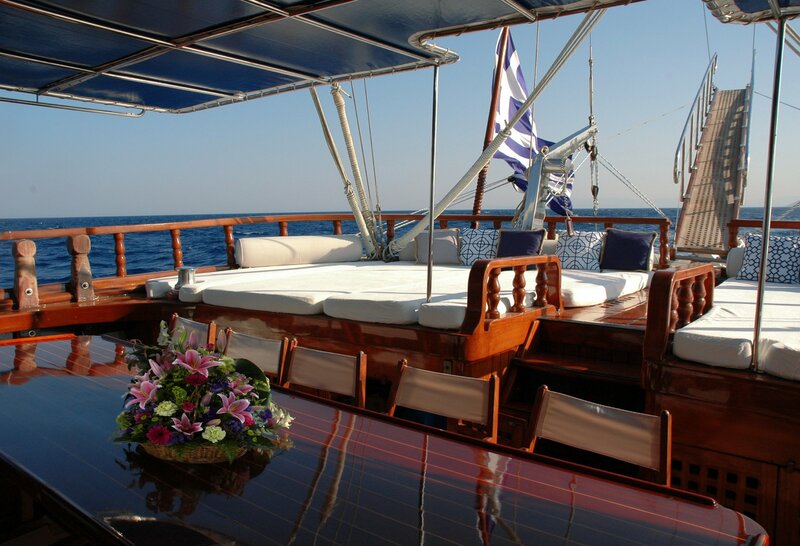 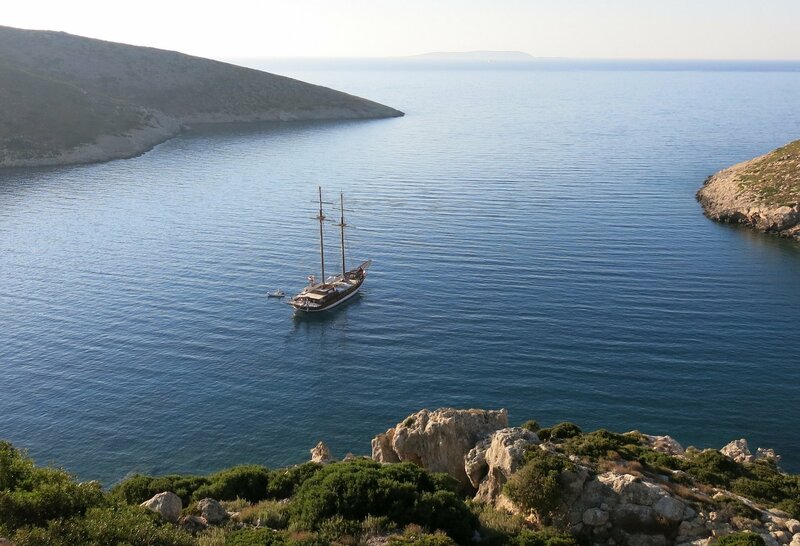 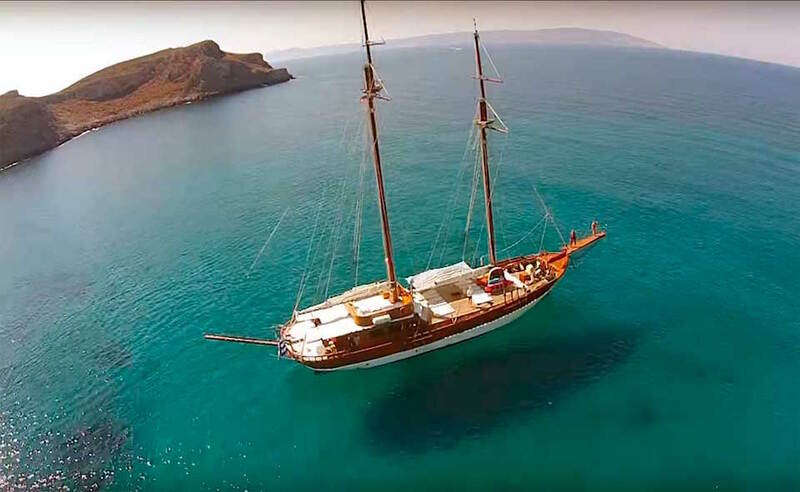 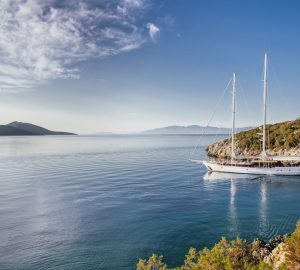 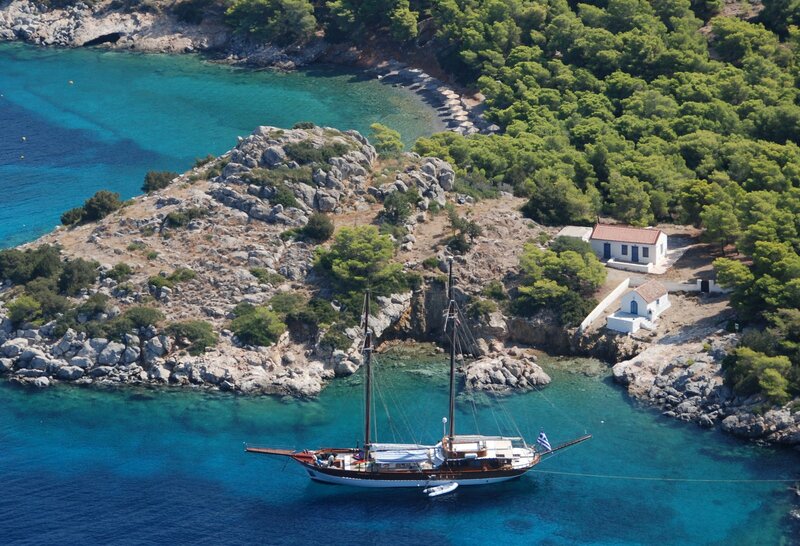 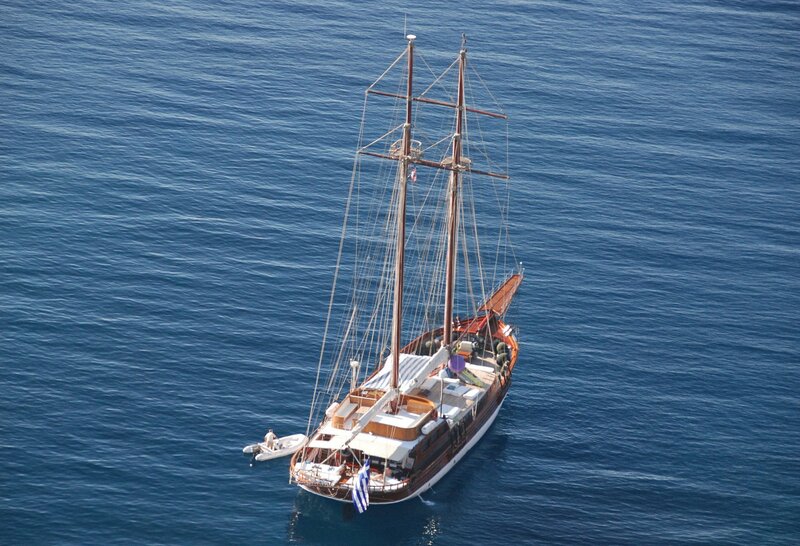 The large sailing yacht provides comfortable cruises for charter guests throughout Greece. 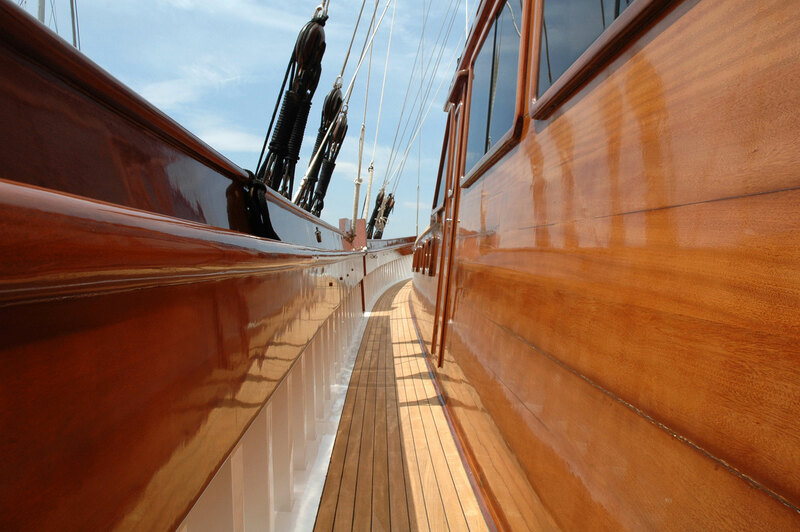 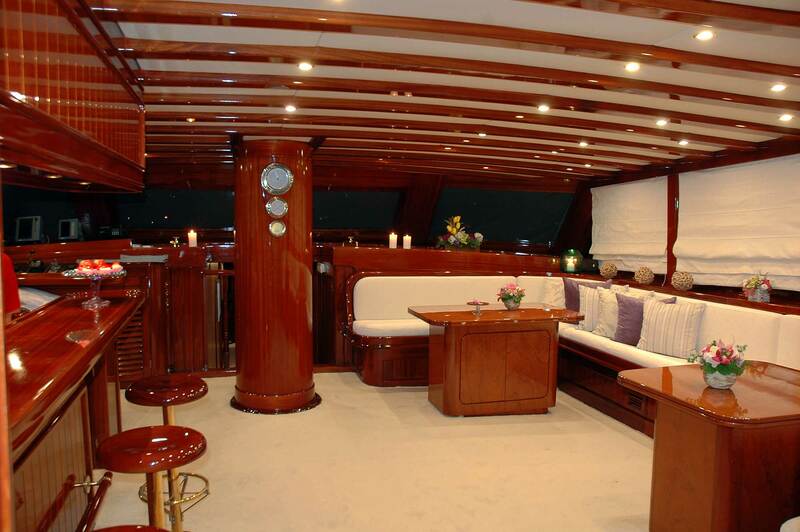 She has a broad beam of 9.40 meters giving her a large interior volume as well as large decks to enjoy. 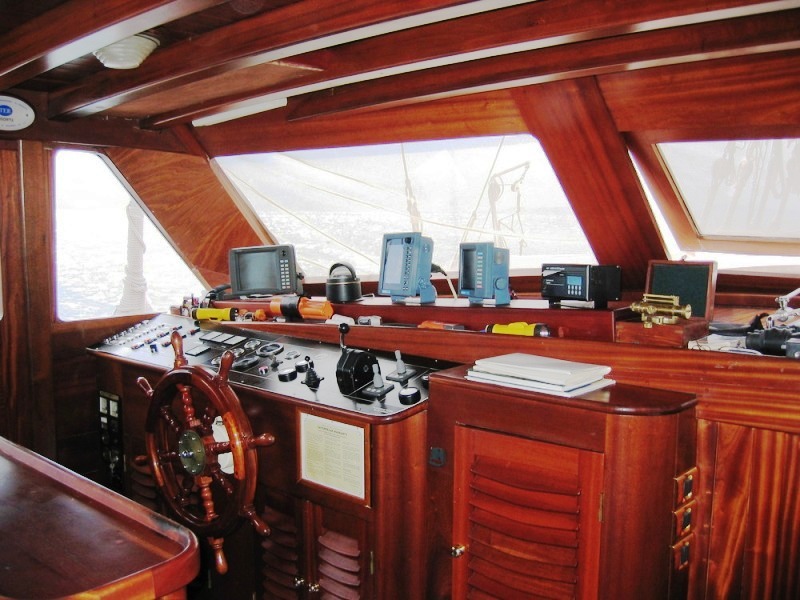 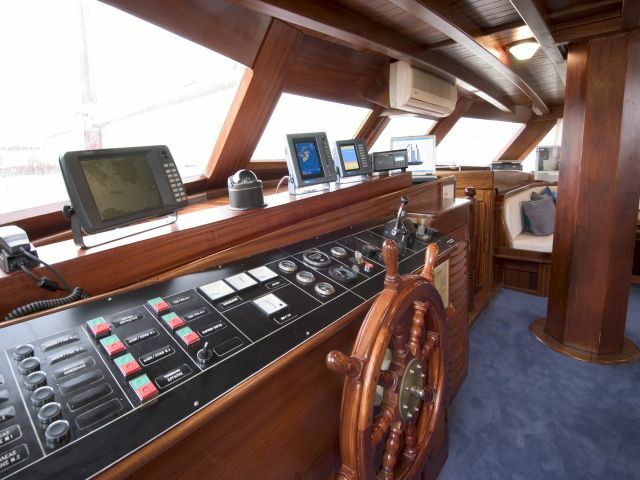 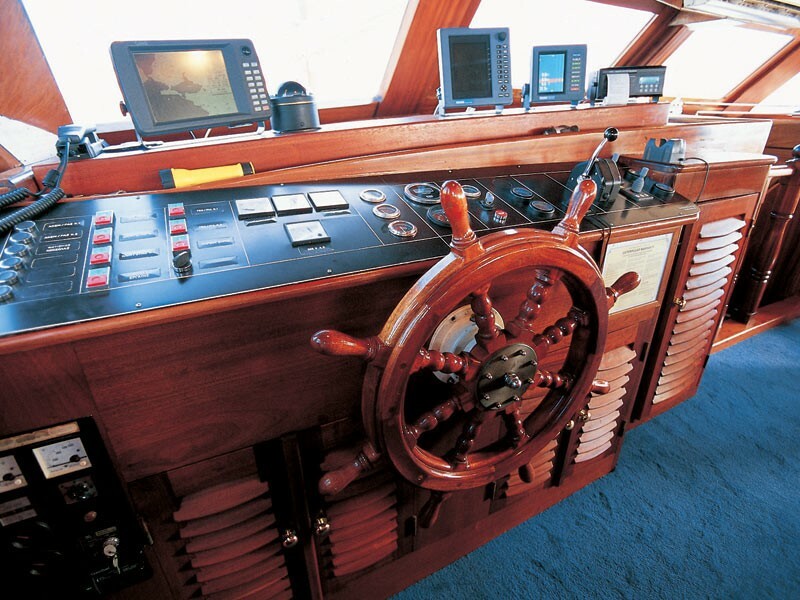 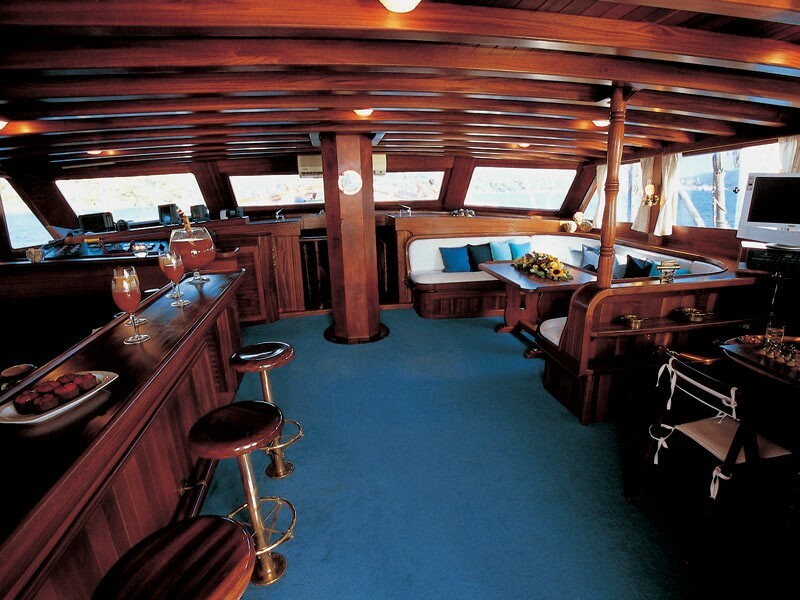 Built in 2000, yacht MATINA had a complete refit in 2004, and in 2008 her saloon was upgraded, and her accommodation layout was reconstructed to include eight cabins for up to 19 guests. 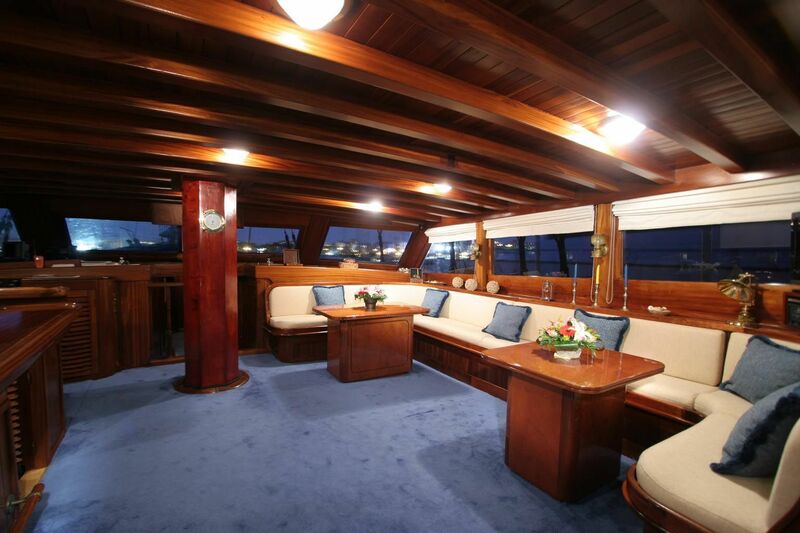 The spacious interior features mahogany and warm colors making you feel at home. 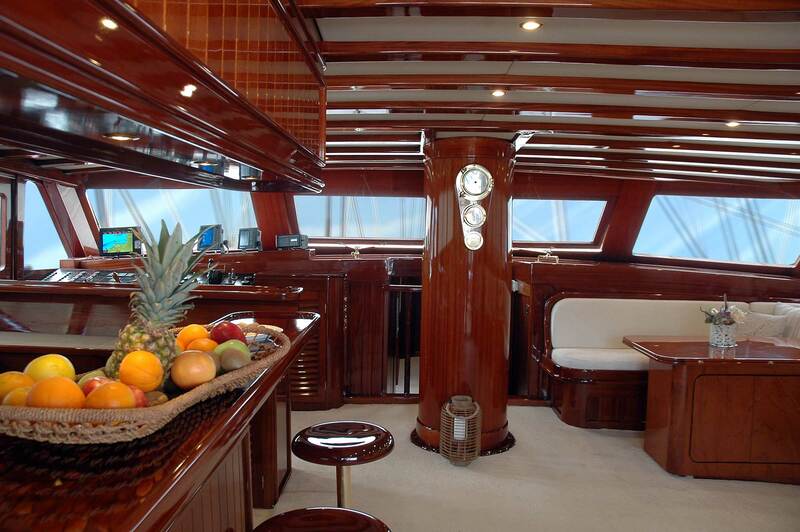 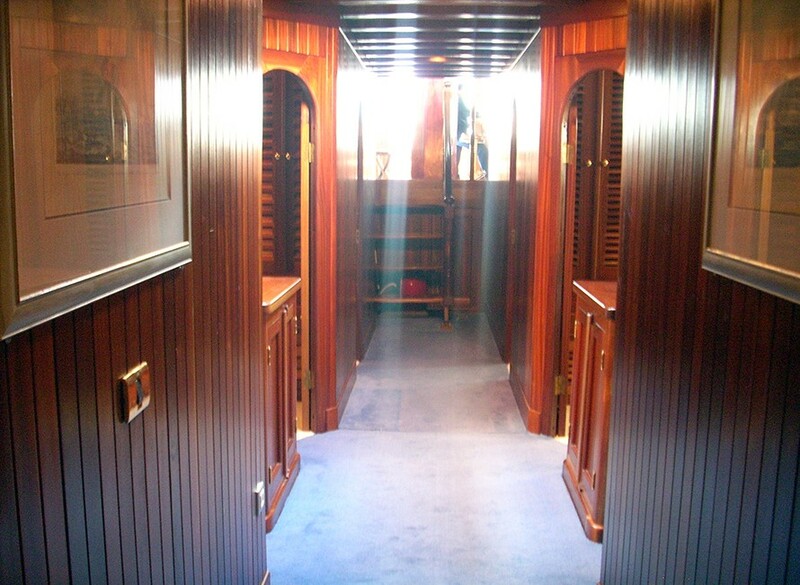 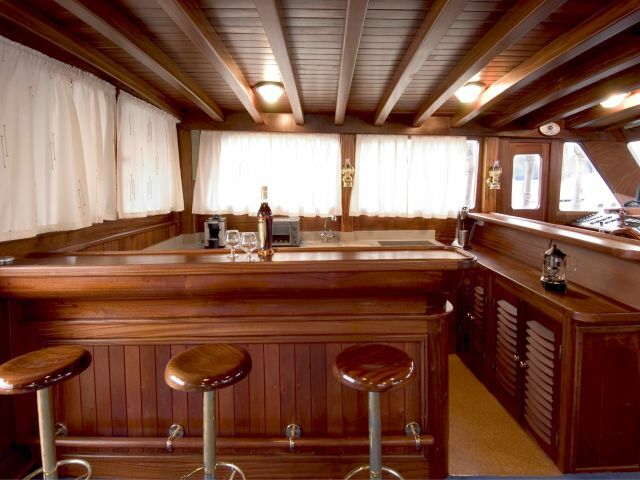 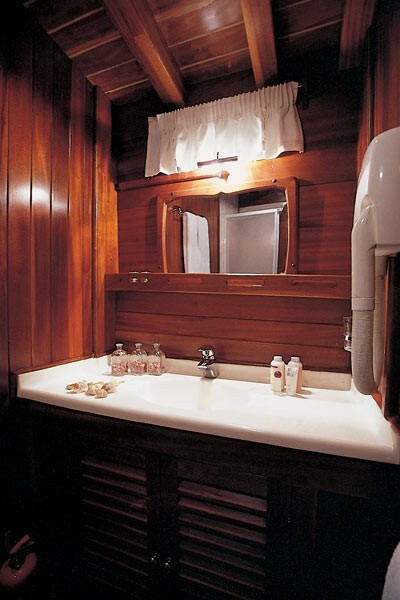 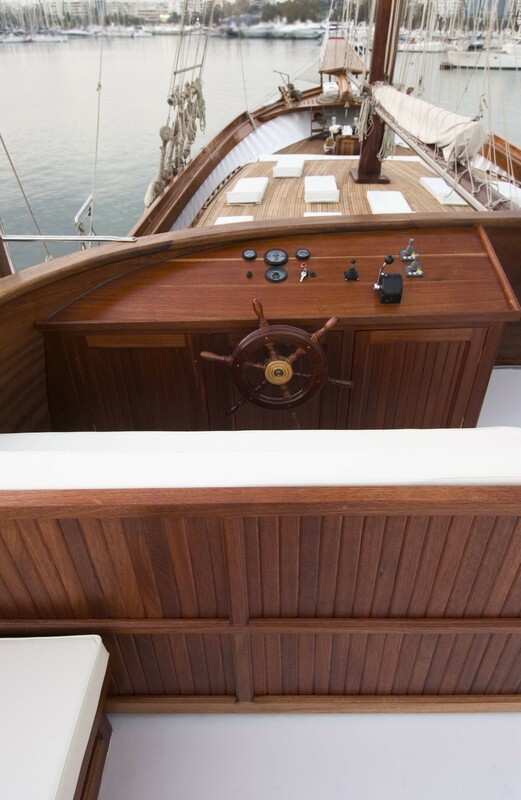 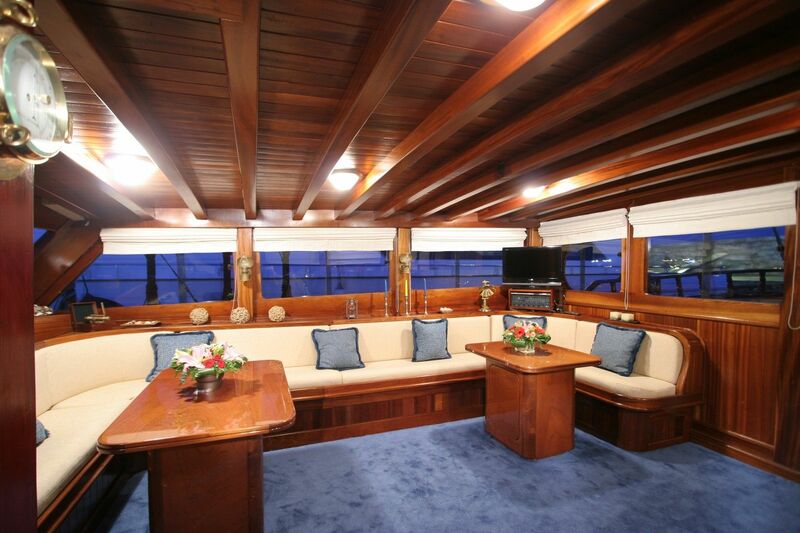 Her main saloon adjacent to the galley area is of traditional design with rich mahogany paneling, where up to 19 charter guests can dine in style around a teak dining table. 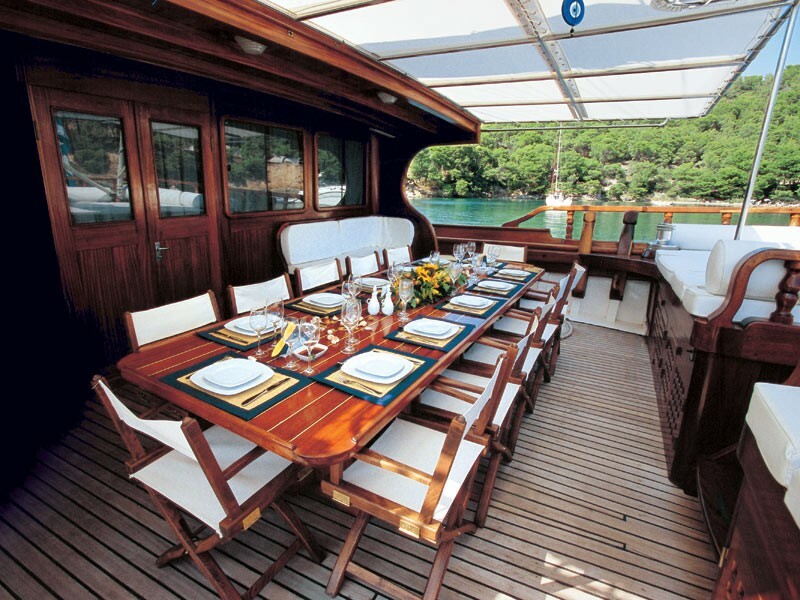 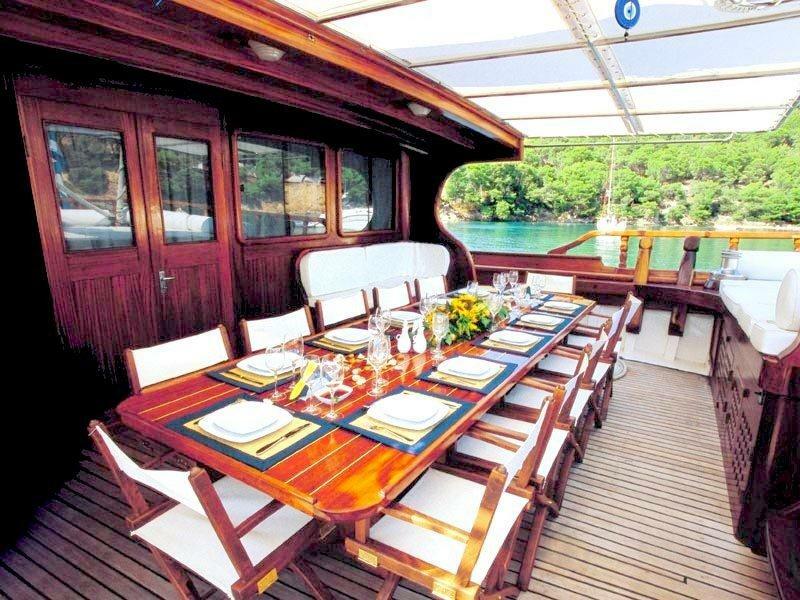 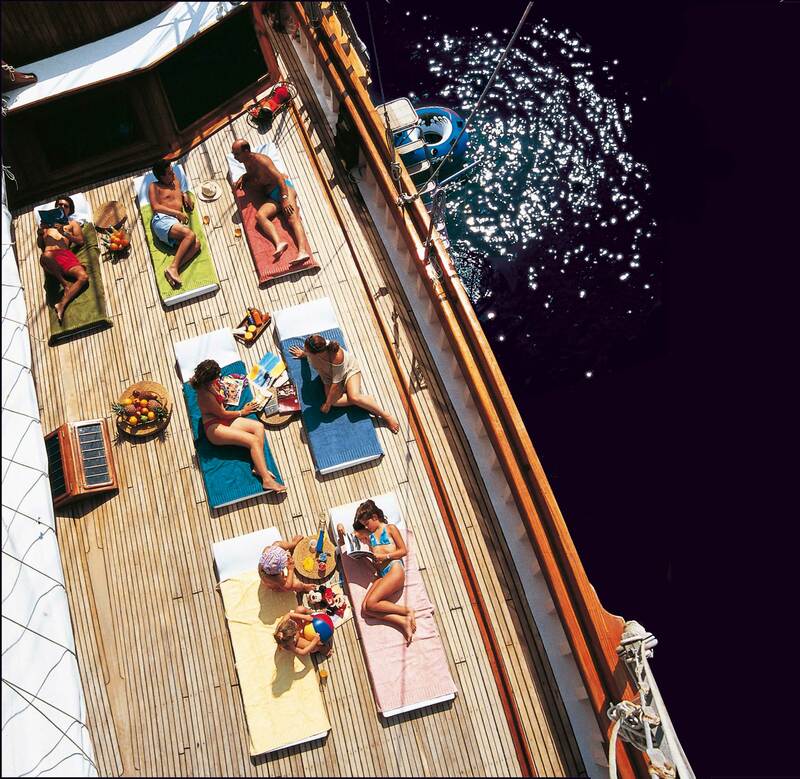 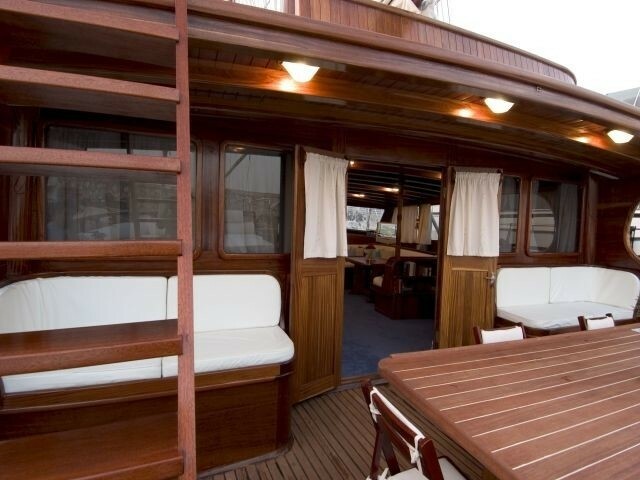 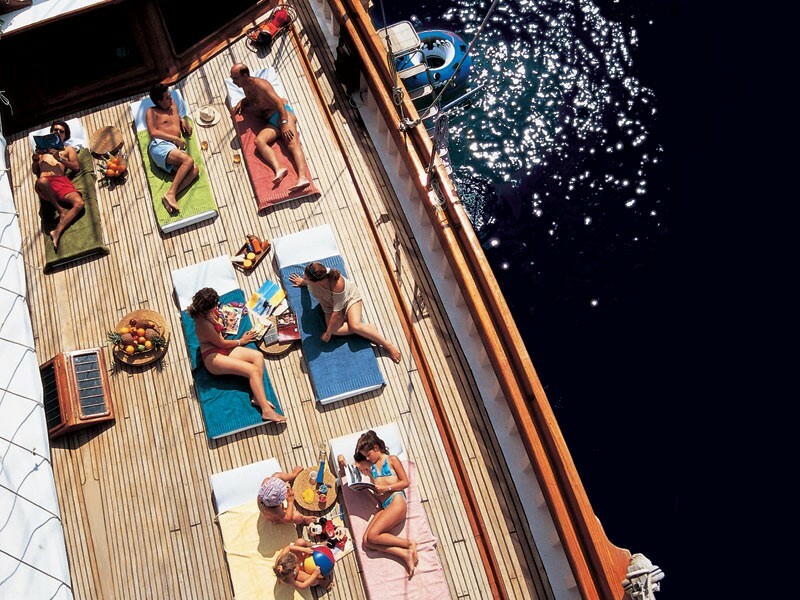 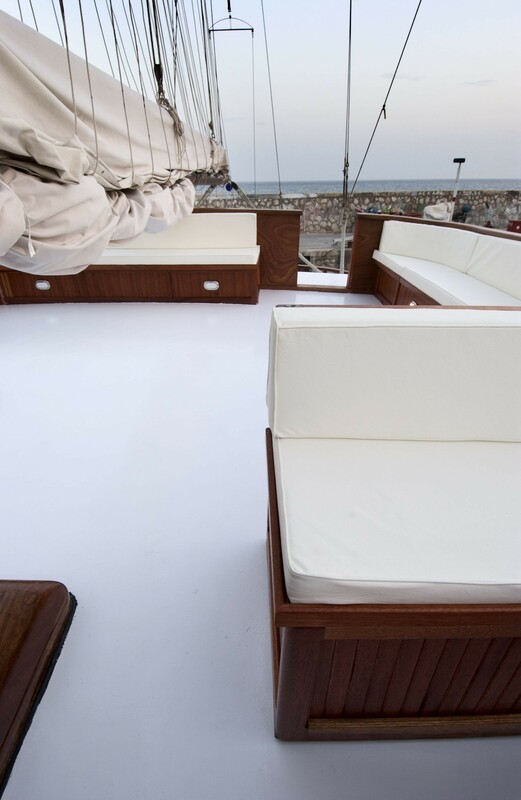 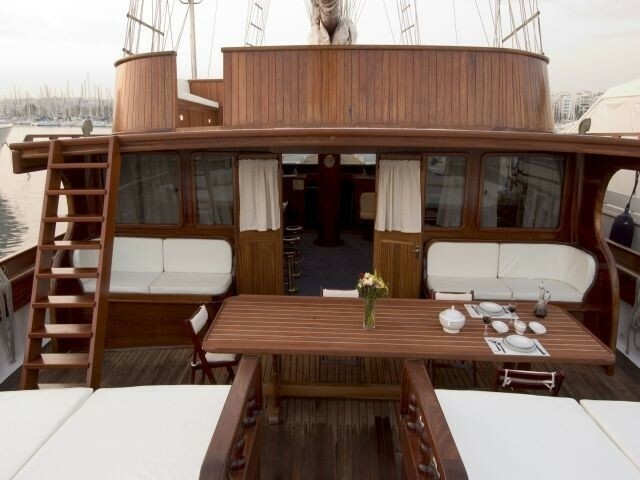 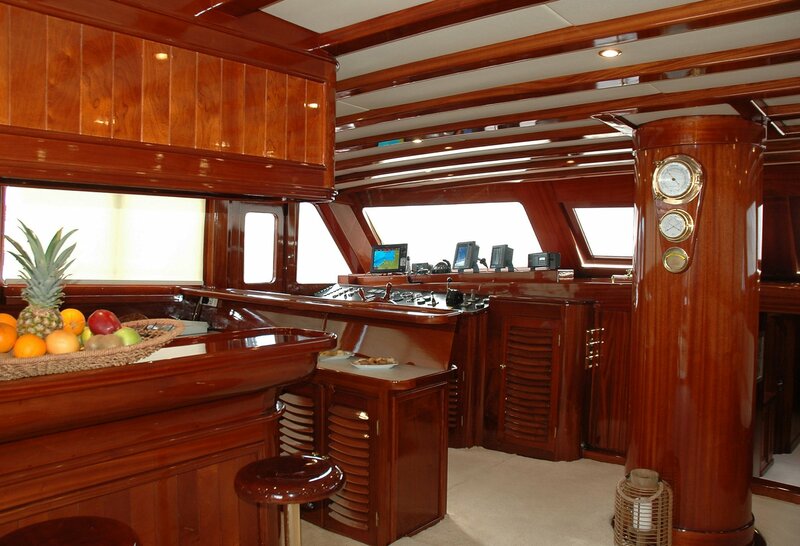 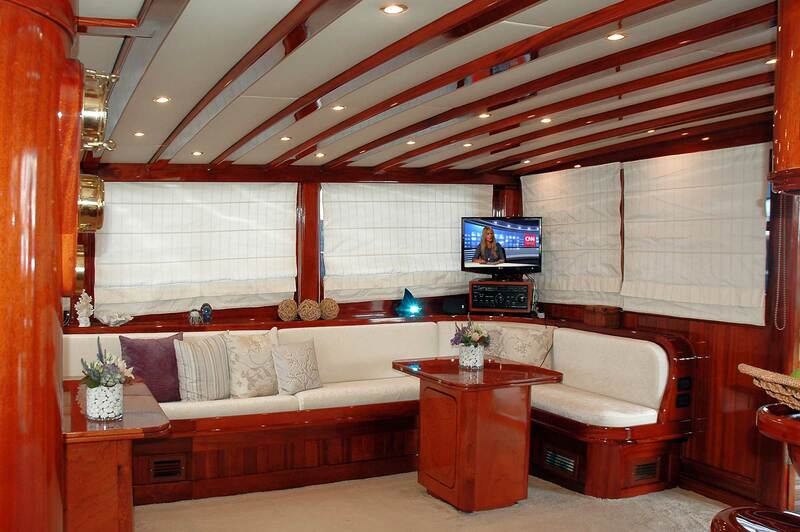 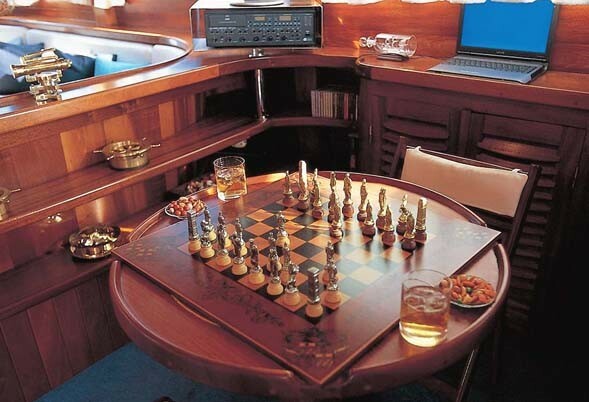 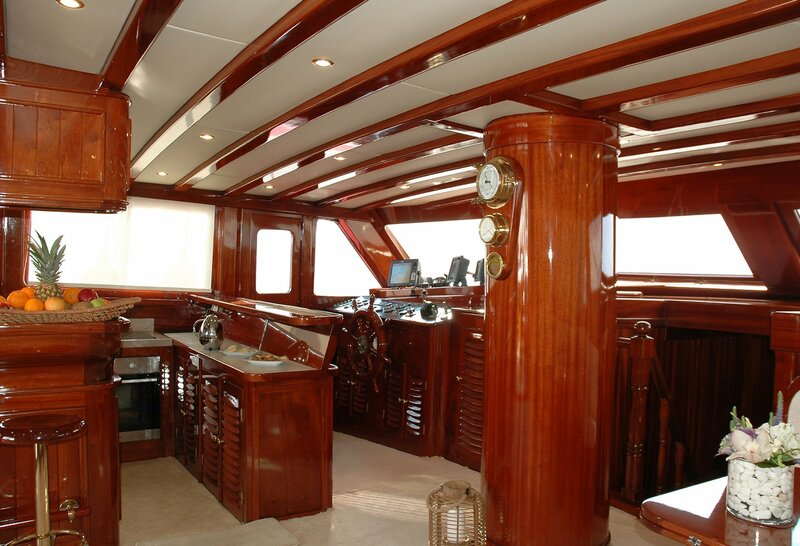 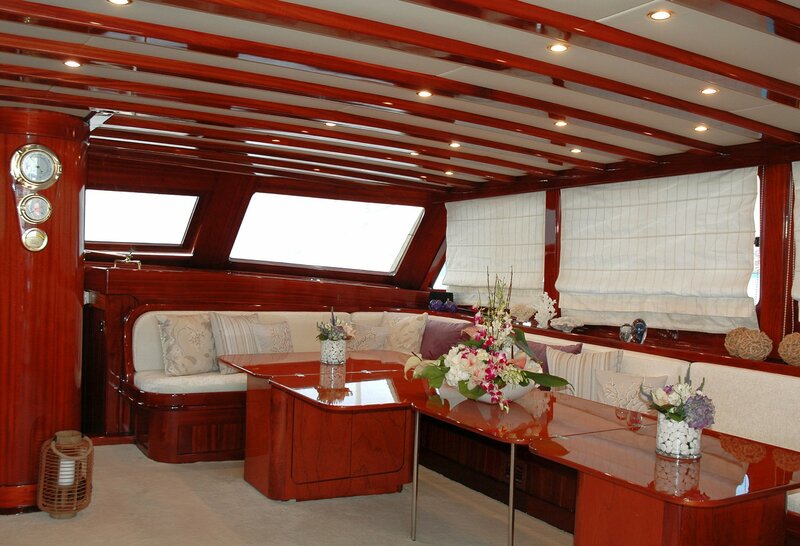 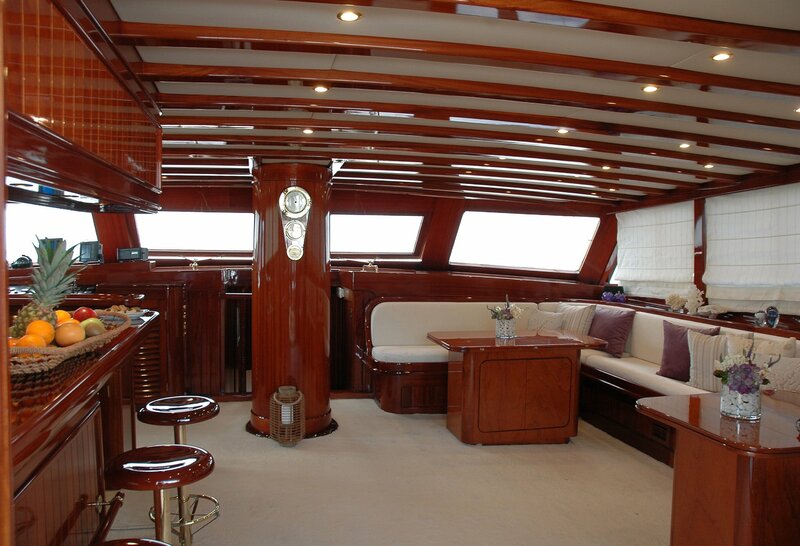 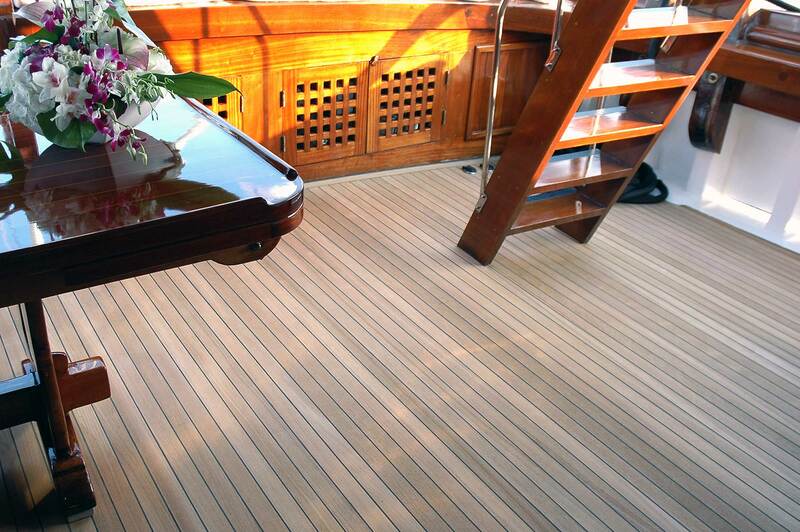 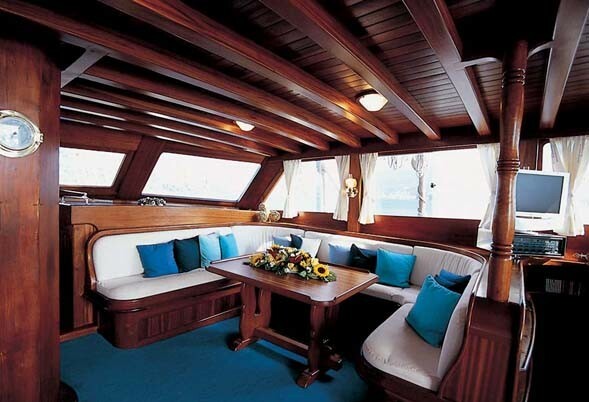 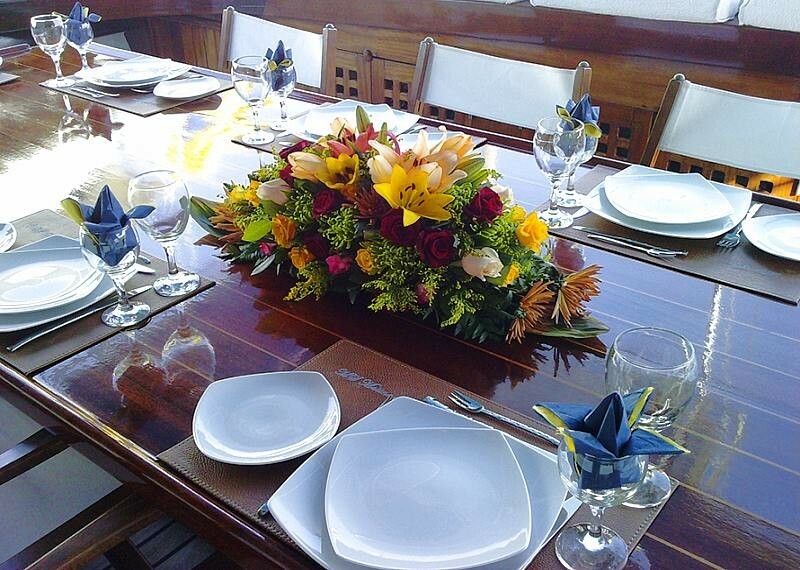 The main saloon leads onto the spacious aft deck with al fresco dining facilities around a teak table for 19. 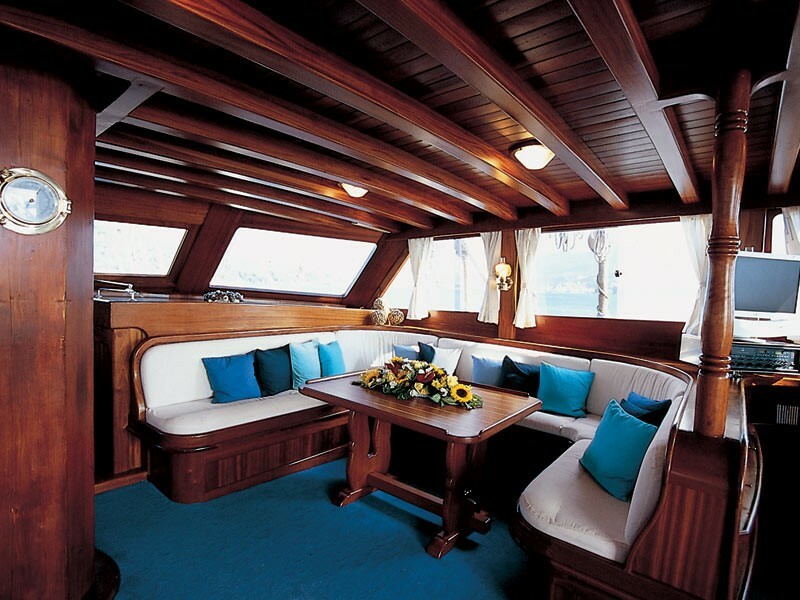 An exceptionally spacious U shaped seating area on the Aft Deck is ideal for simply relaxing with a nice book, sunbathing or sipping a delicious cocktail. 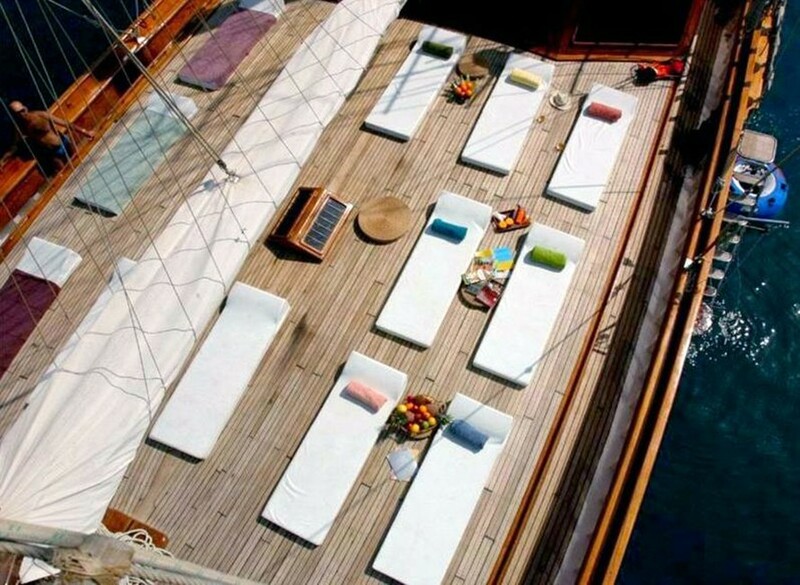 There is a beautiful teak deck that provides ample space for sunbathing and relaxing on large cushions or dining al fresco. 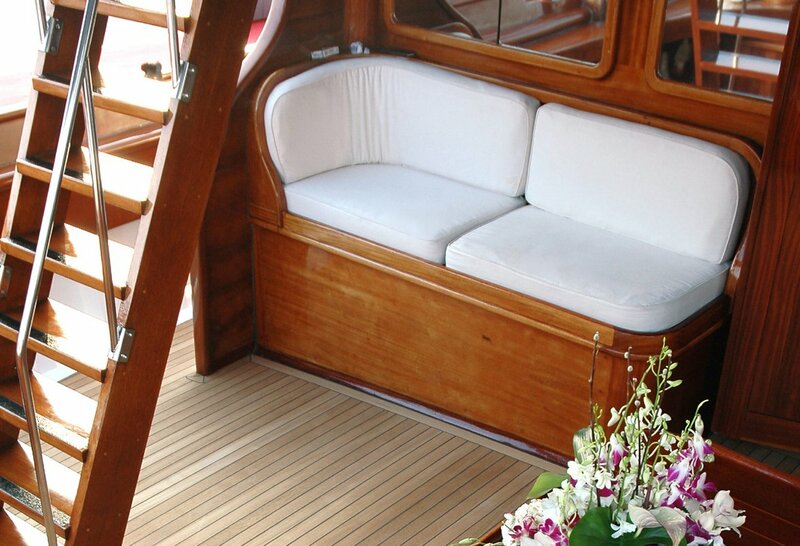 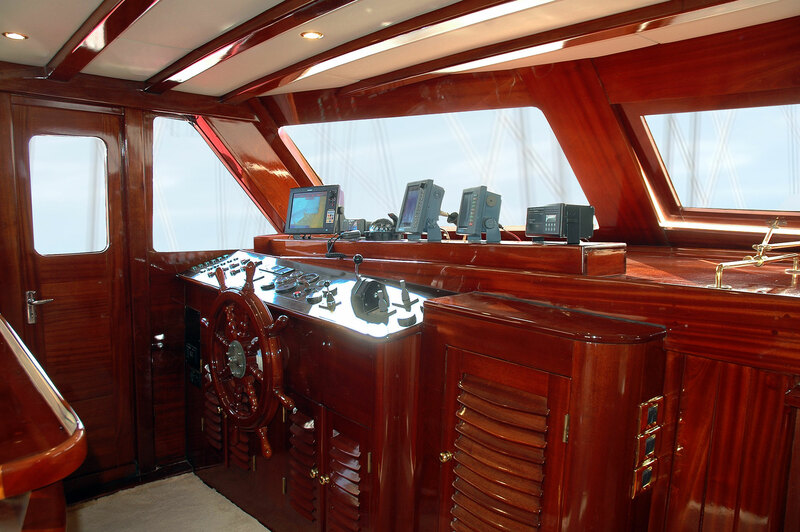 There is a panoramic view from the flybridge which is a favorite spot for keeping an eye on passing scenery. 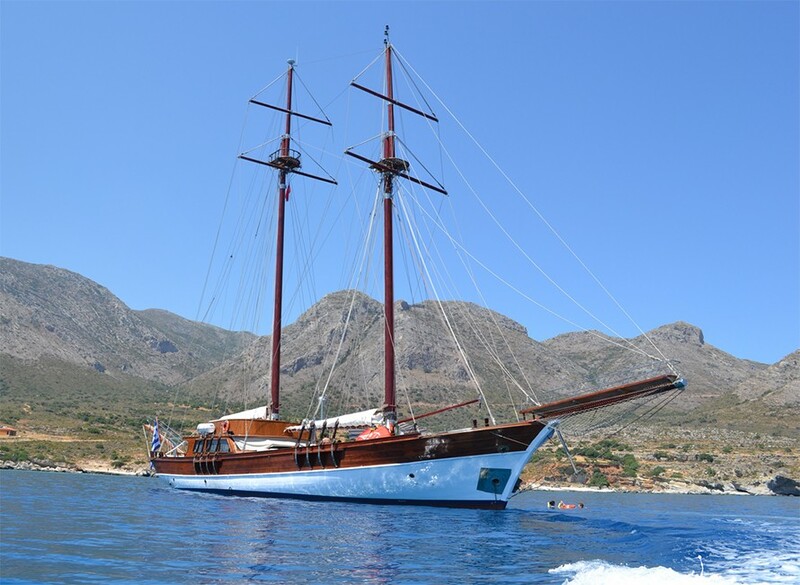 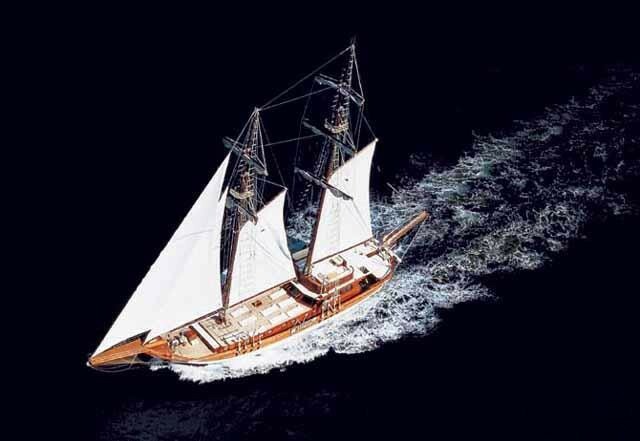 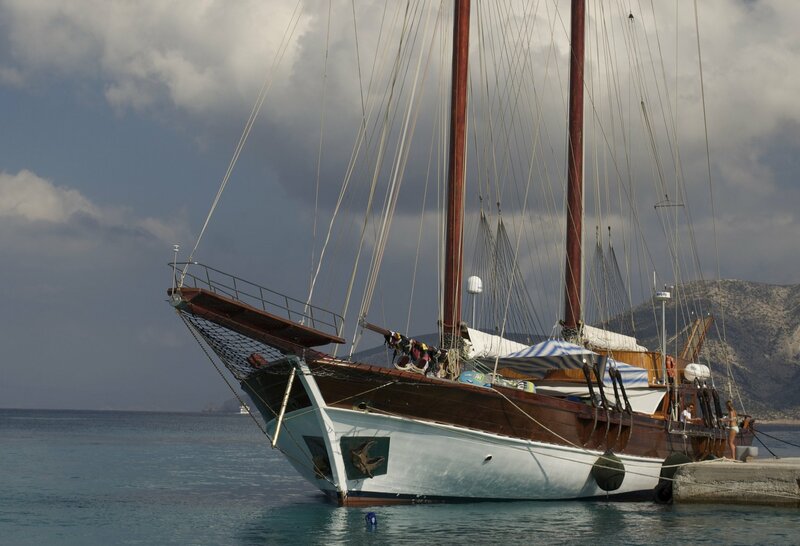 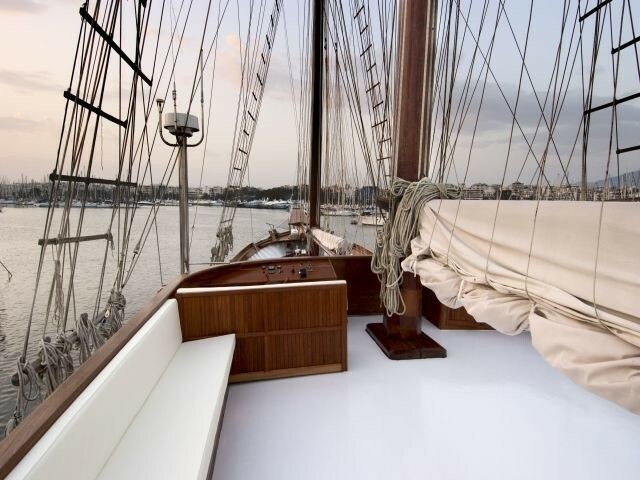 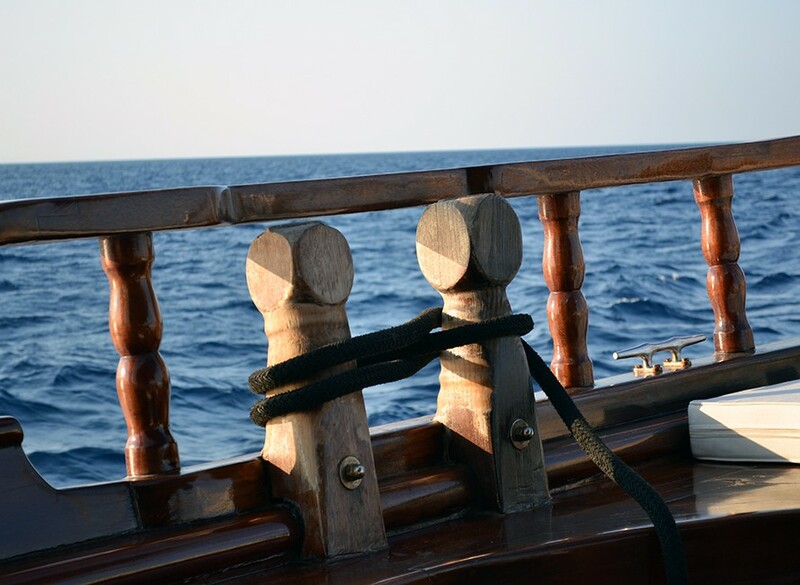 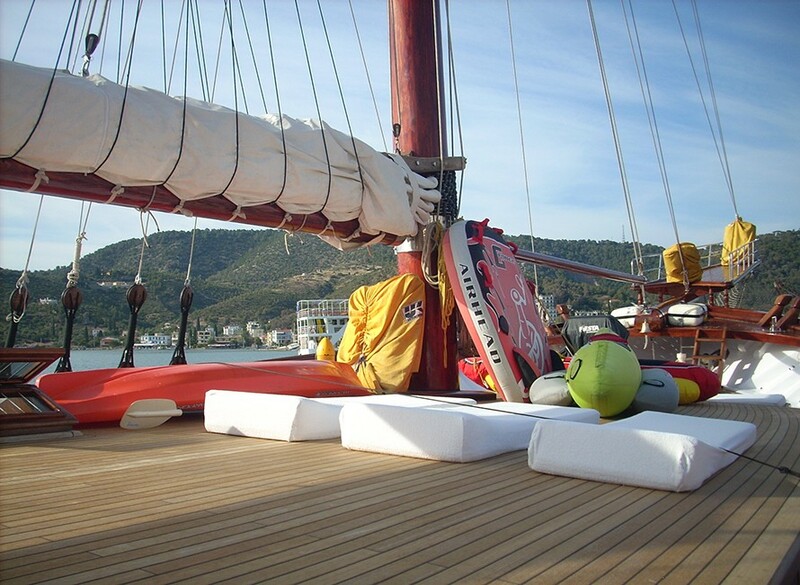 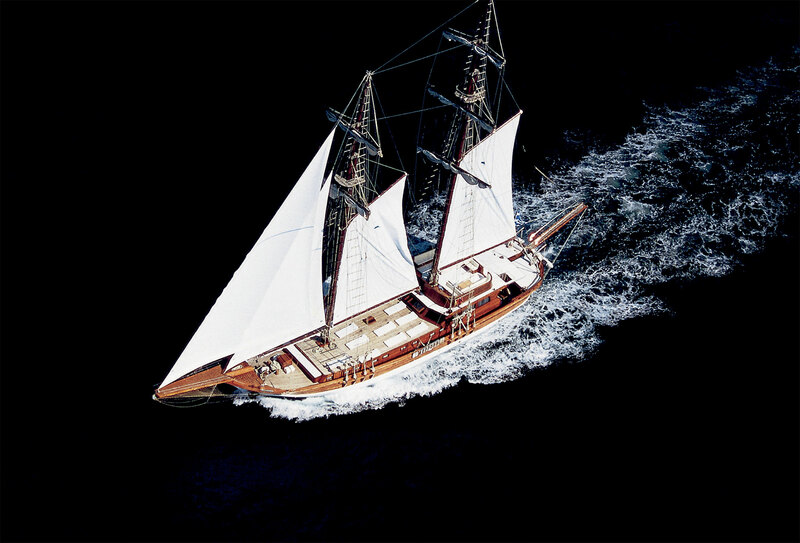 MATINA has a sail area of 1.500 sqm, providing her with incredible sailing performance. 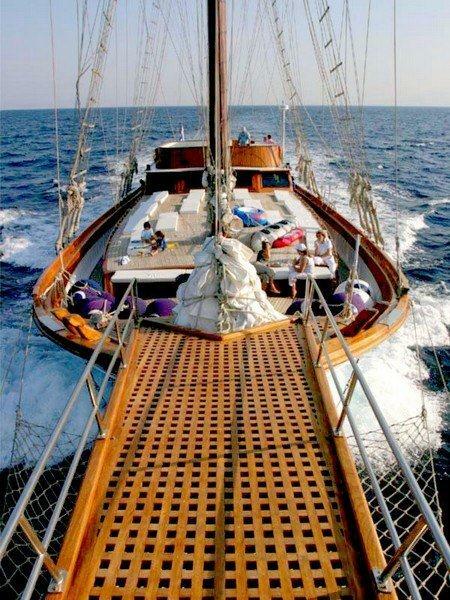 She has the ability for some real sailing with a cruising speed of 11 Knots. 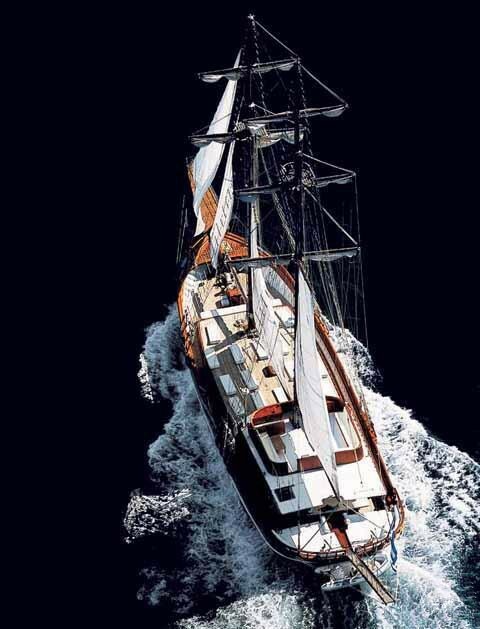 Her 250 tons gives stability and security. 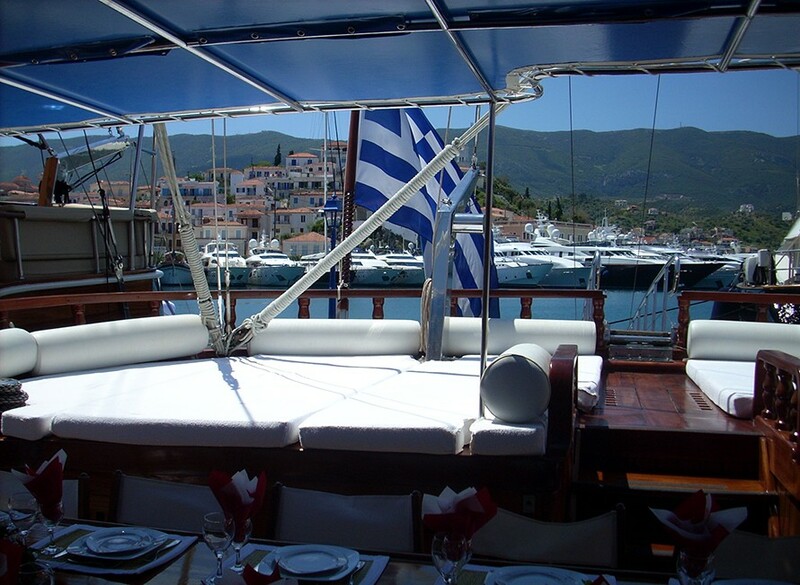 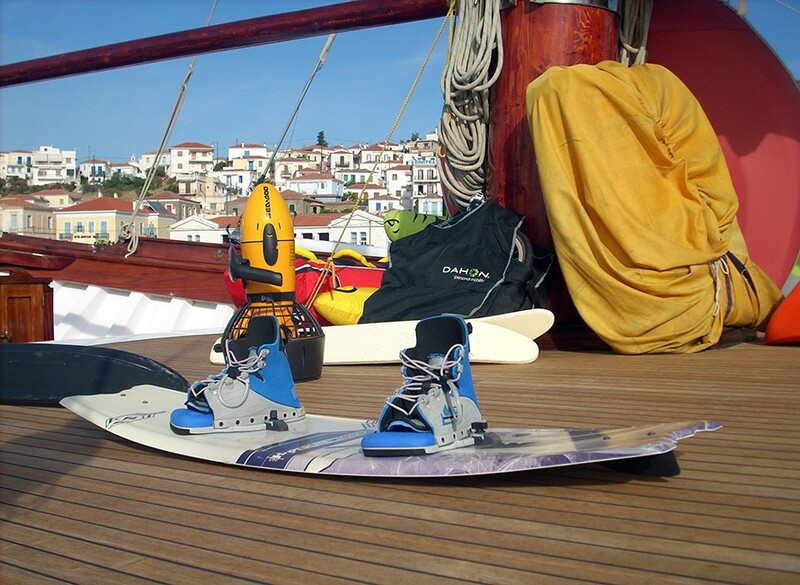 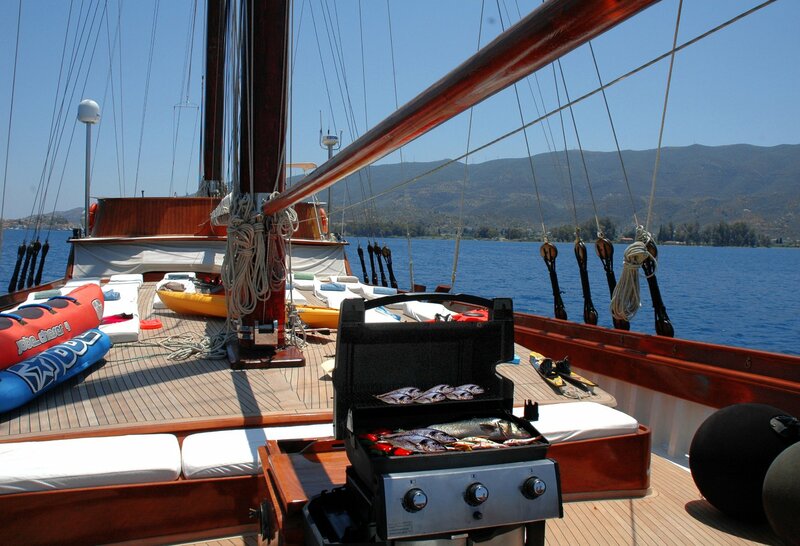 There is always something to do aboard, from enjoying the delicious fresh cuisine, having fun on the water sports toys, listening to her superb stereo, or just relaxing with a good book. 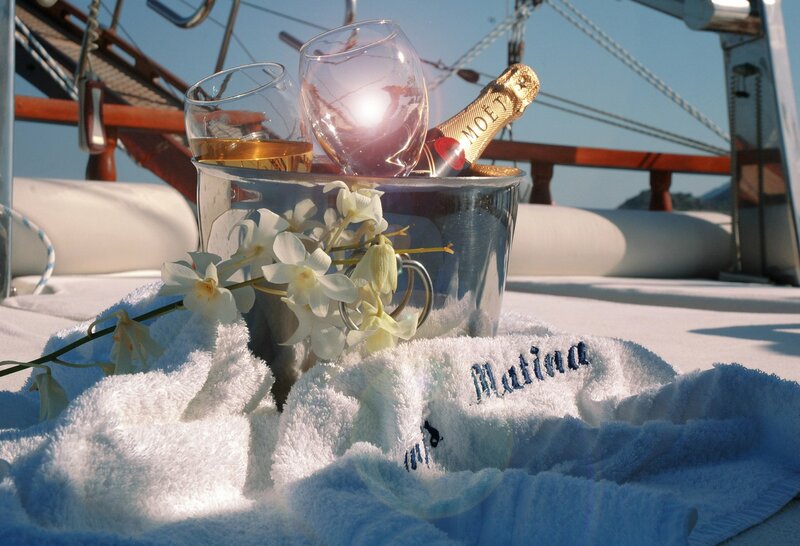 MATINA has a professional crew who will see that you are well cared for with their gracious hospitality and a desire to make your trip unforgettable. 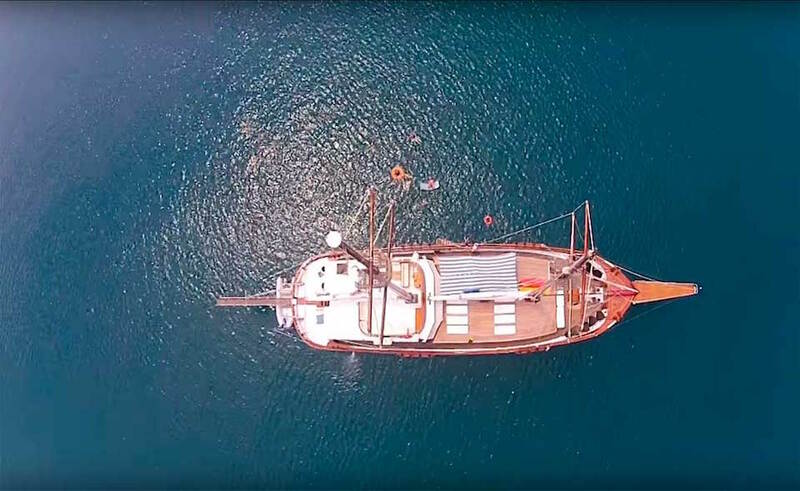 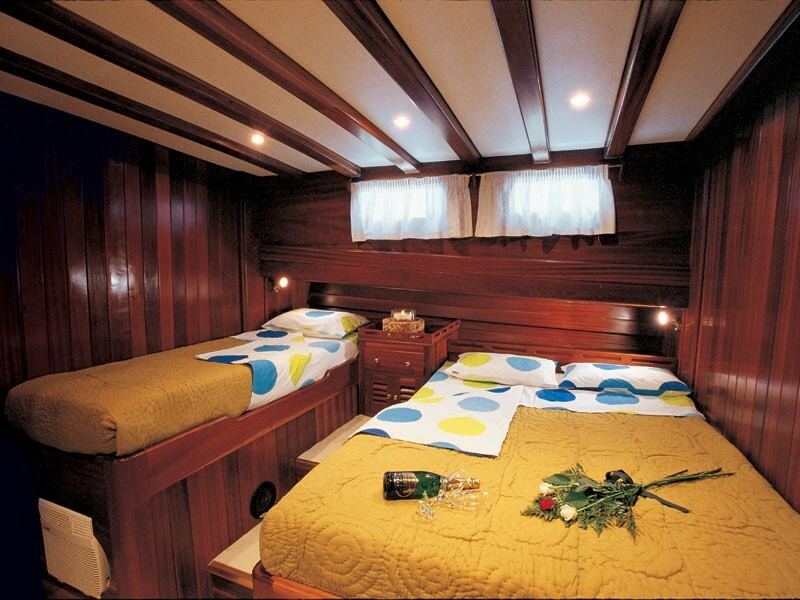 MATINA can accommodate up to 19 guests in very comfortable accommodation which includes eight luxury staterooms that are beautifully finished throughout in rubbed effect mahogany. 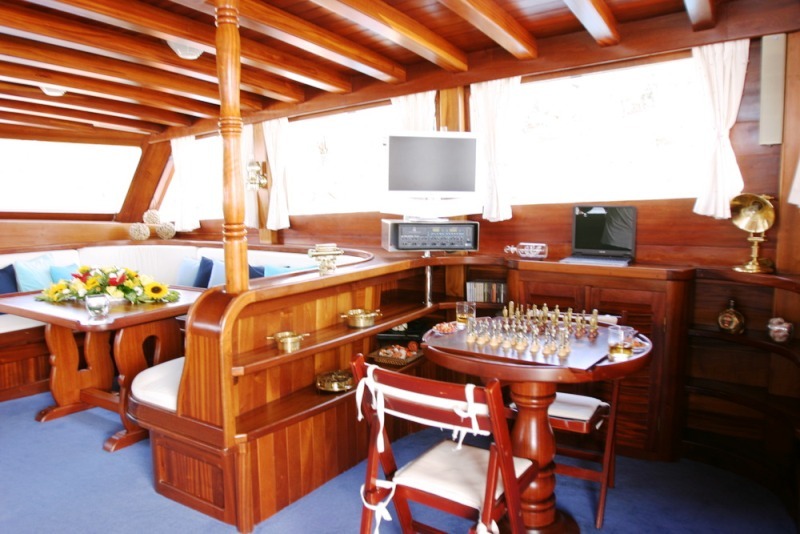 Each cabin, well ventilated with air-conditioning as well as opening portholes and hatches, has ample storage space and wide berths. 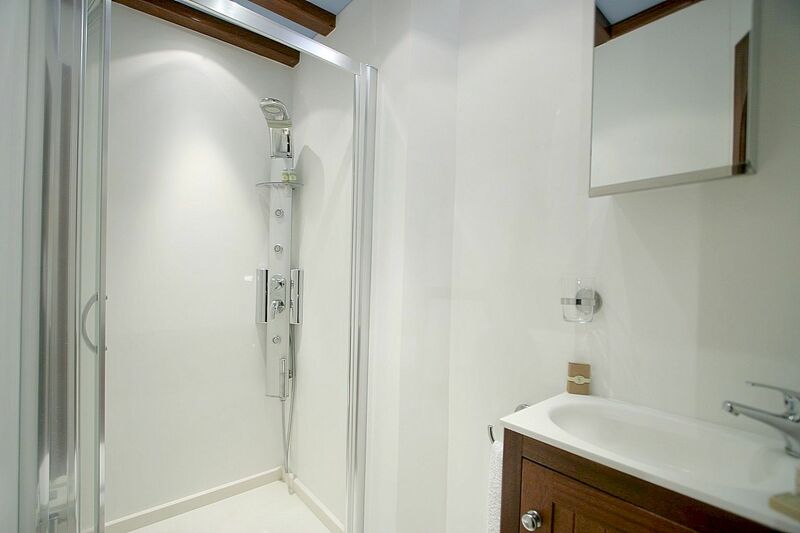 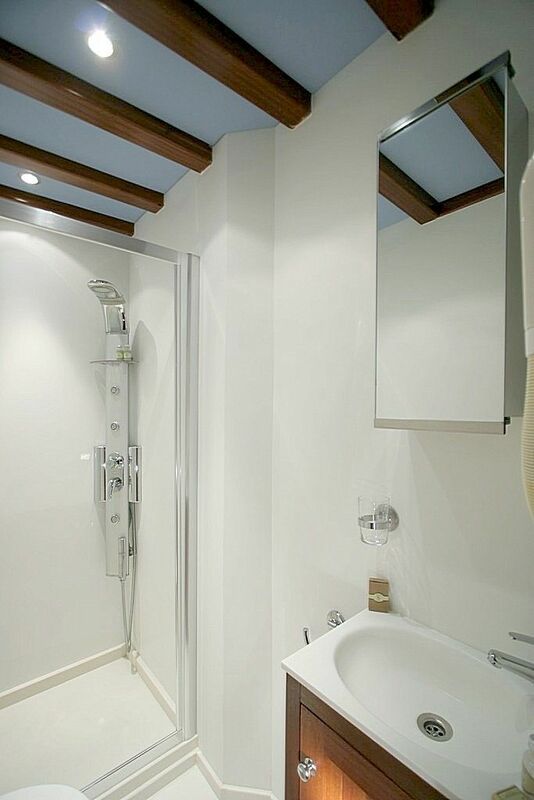 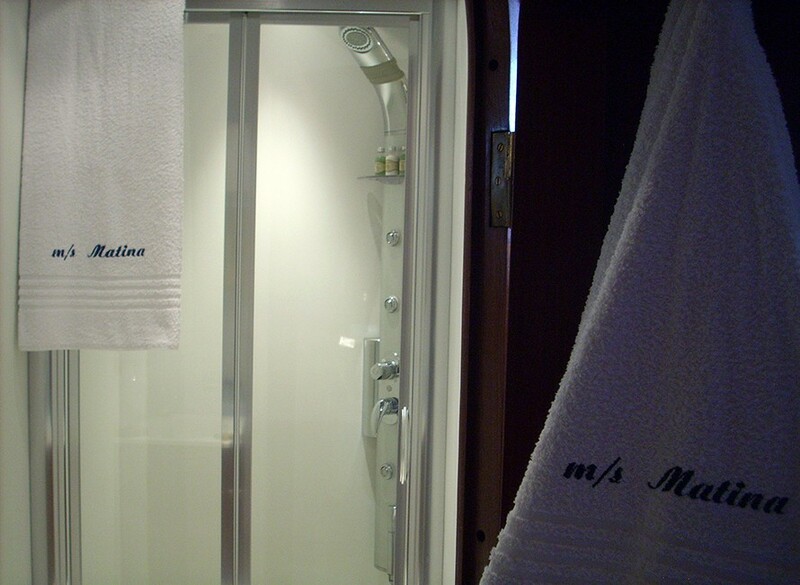 The cabins are simple and tastefully decorated cabins all have en-suite shower and WC facilities. 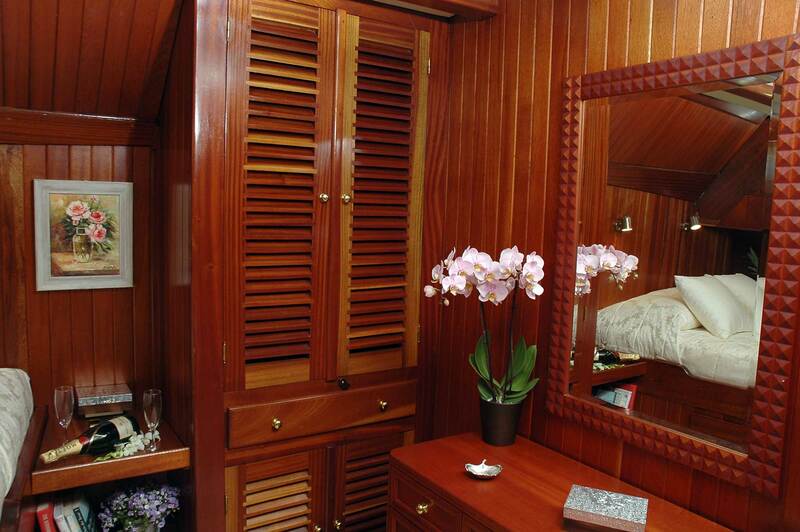 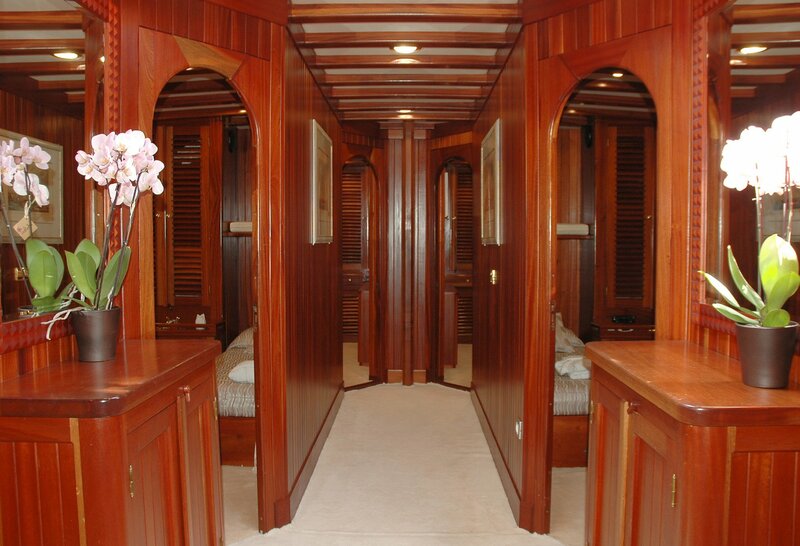 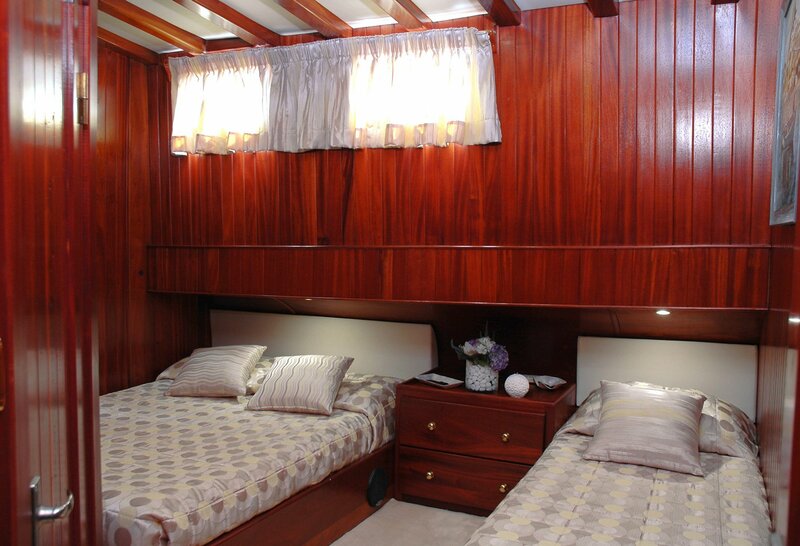 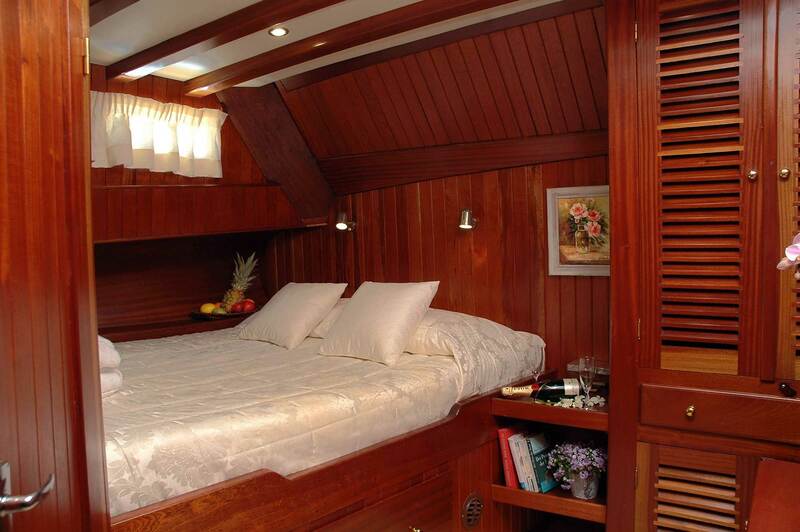 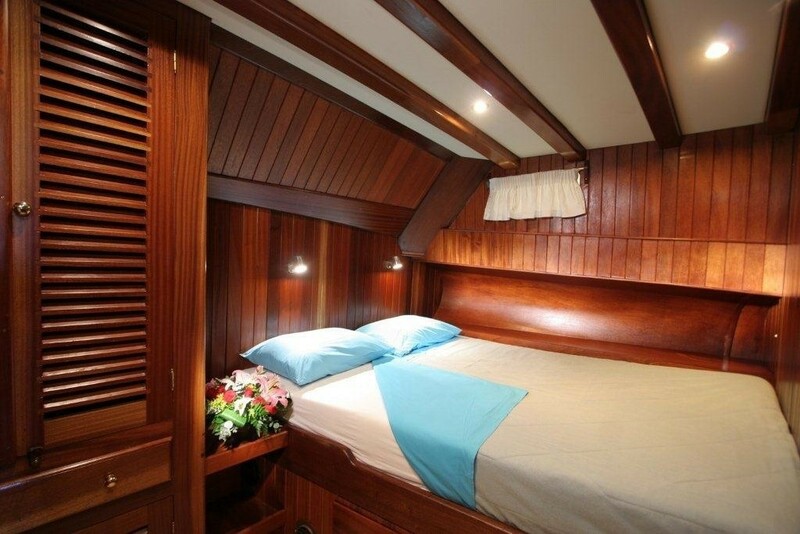 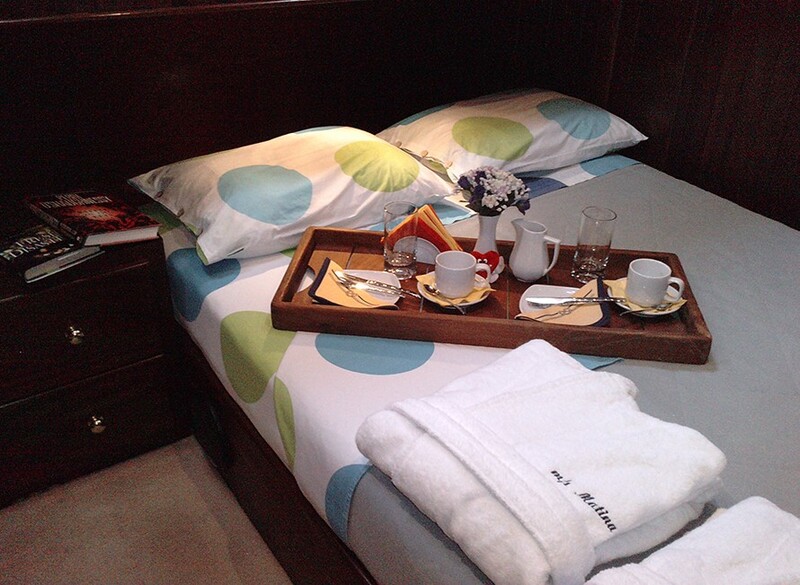 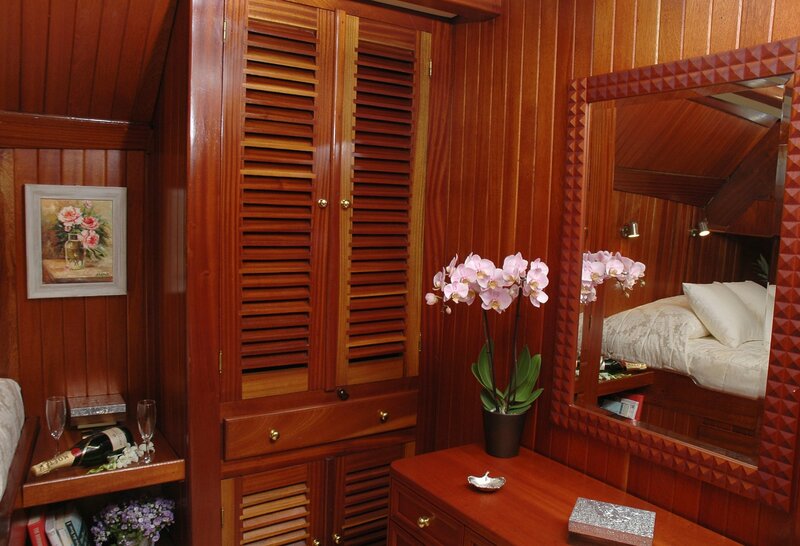 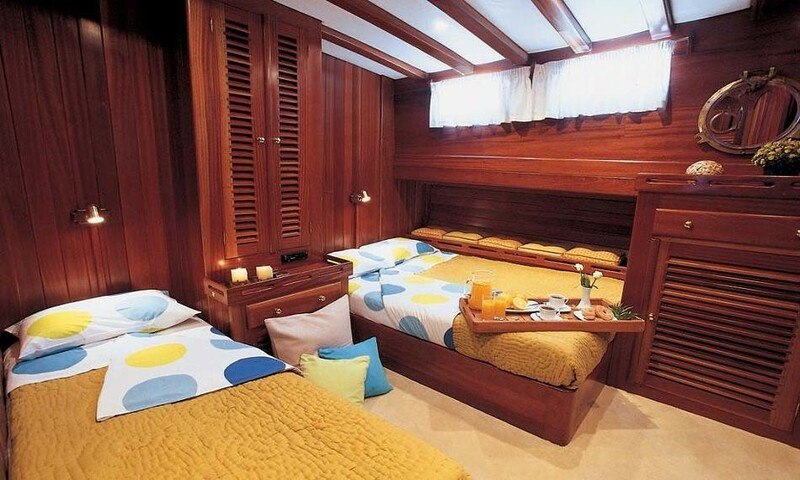 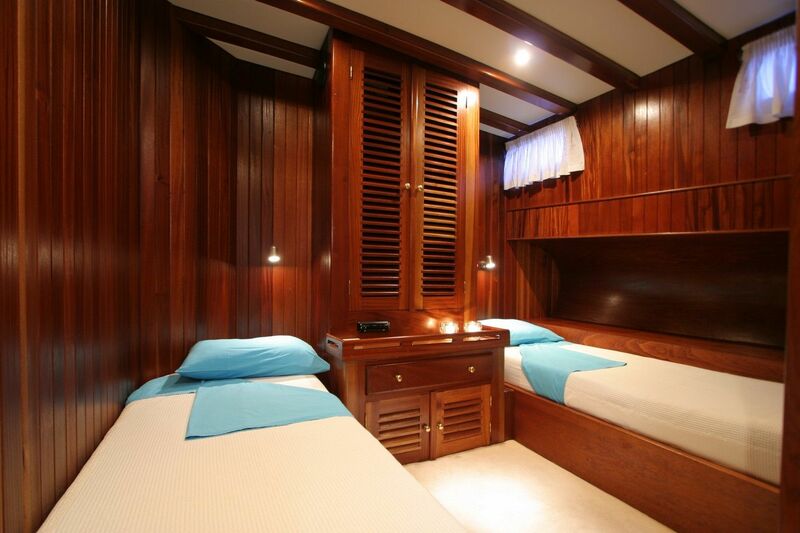 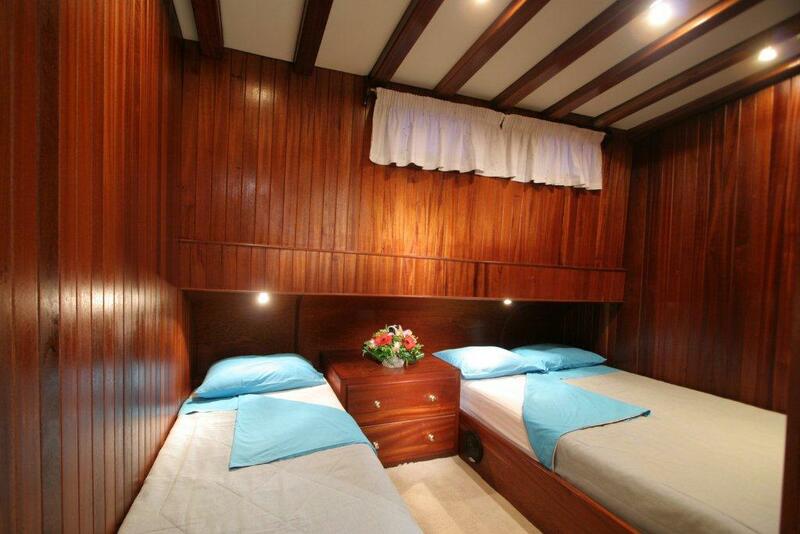 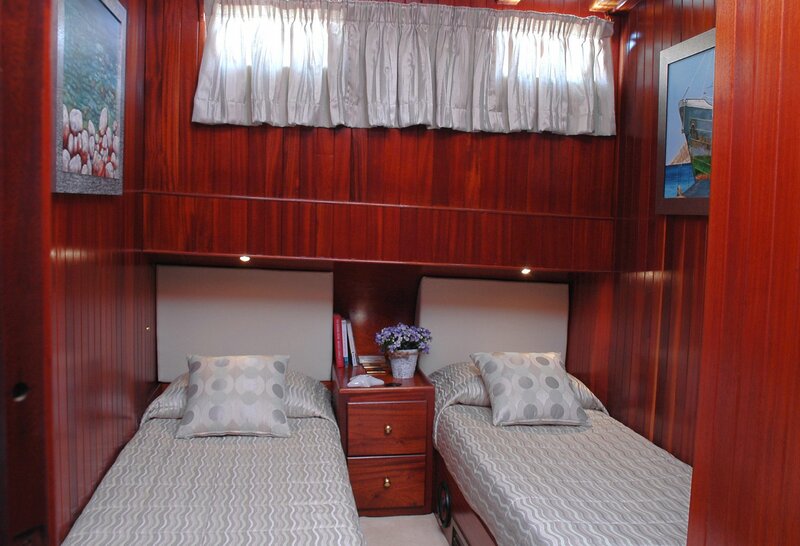 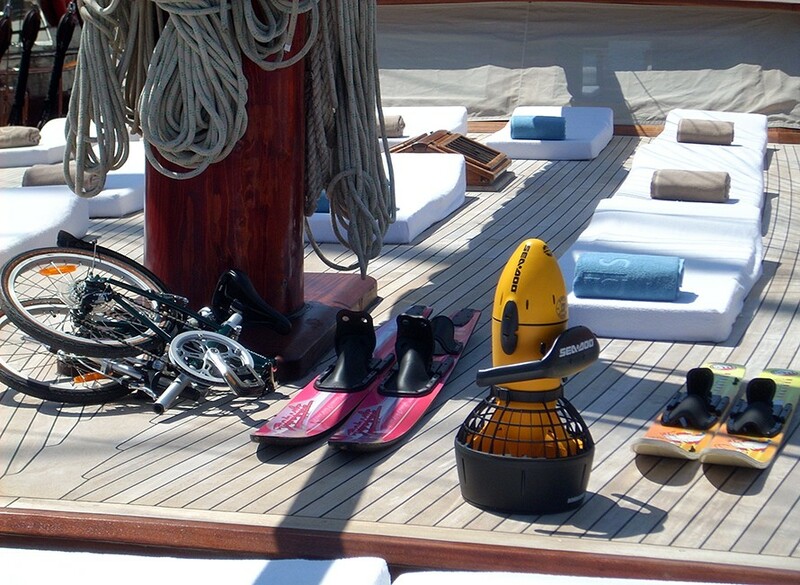 All of the staterooms have a radio/CD player, safebox and adequate drawer storage.